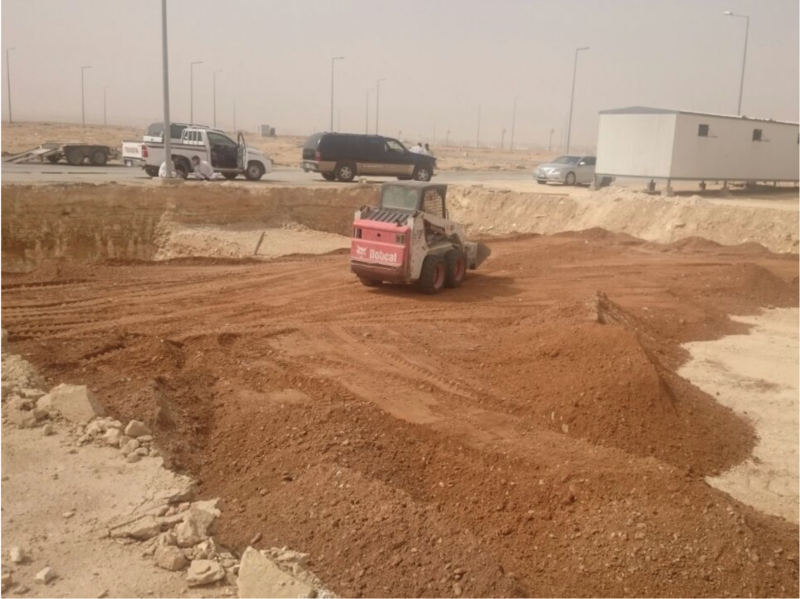 The construction has begun on the first residential building in Riyadh, Saudi Arabia. 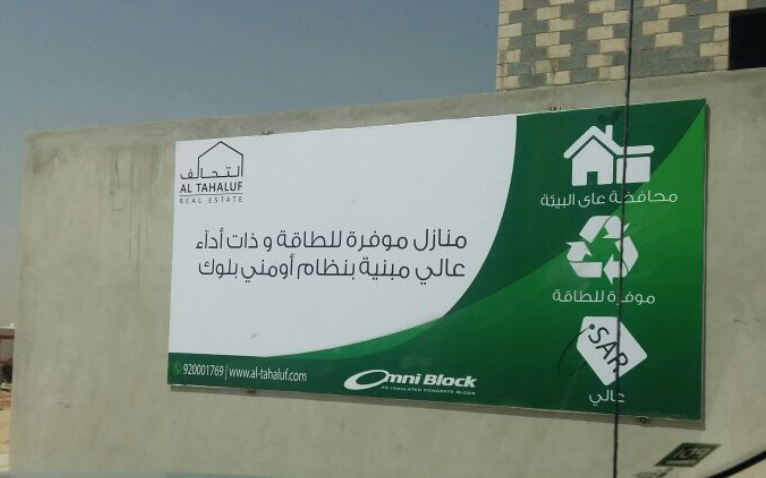 The builder/developer Al-Tahaluf Real Estate, a subsidiary of K. Hovnanian, a USA based company, is closely working with the Saudi Ministry of Housing to bring highly sought after cost-effective and energy efficient construction technologies to the Kingdom. 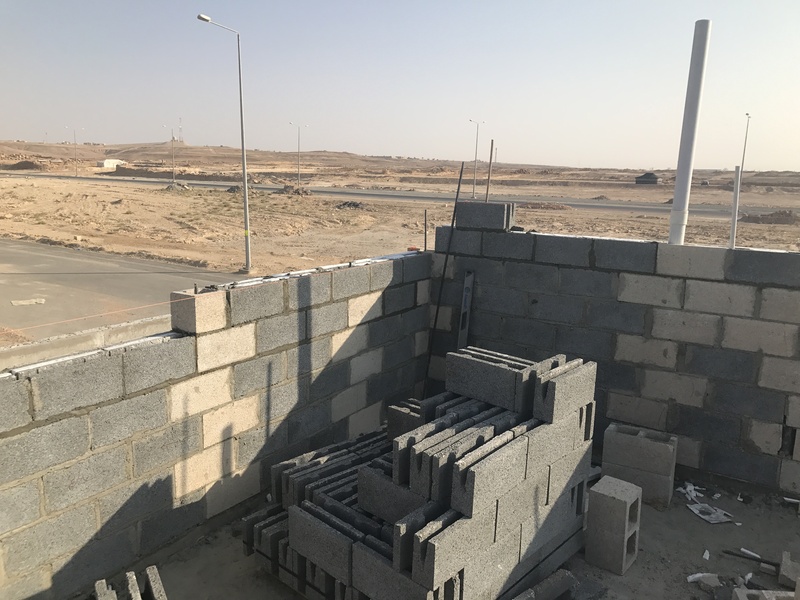 After considerable due diligence and studies of numerous insulated wall systems, Al-Tahaluf selected Omni Block as their product of choice. 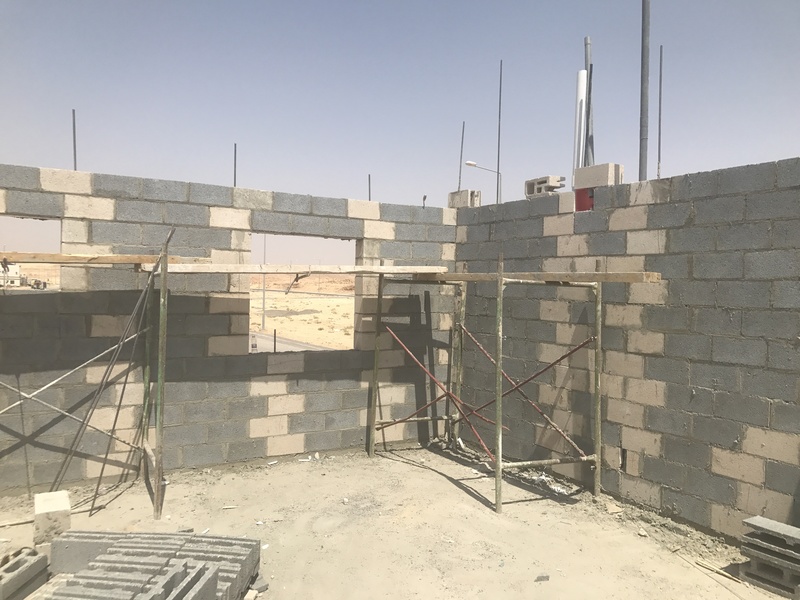 Construction began August 13, 2017 on a 266 square meter (3400 square feet) single family middle income residence. The photos below document the construction process and the surrounding development improved with paved roads and decorative light posts. 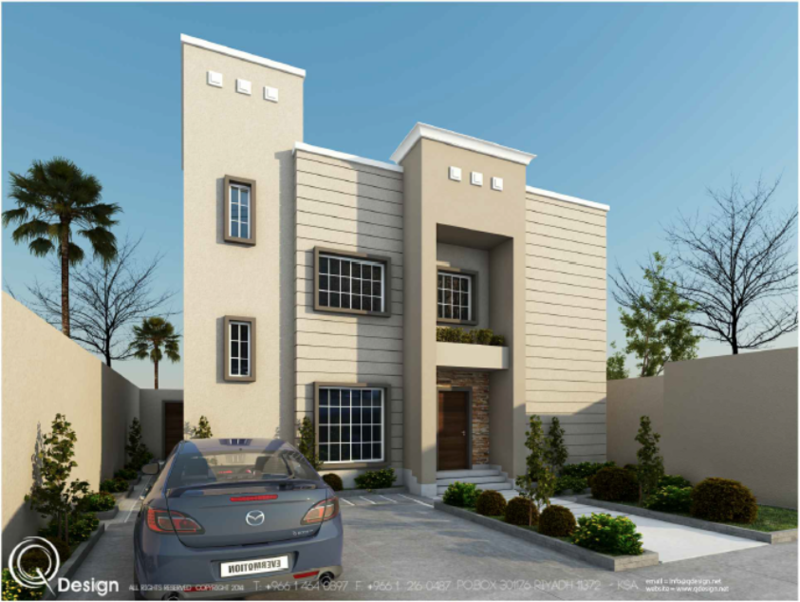 This link drawings and engineering is the block design details and complete structural engineering of the villa. 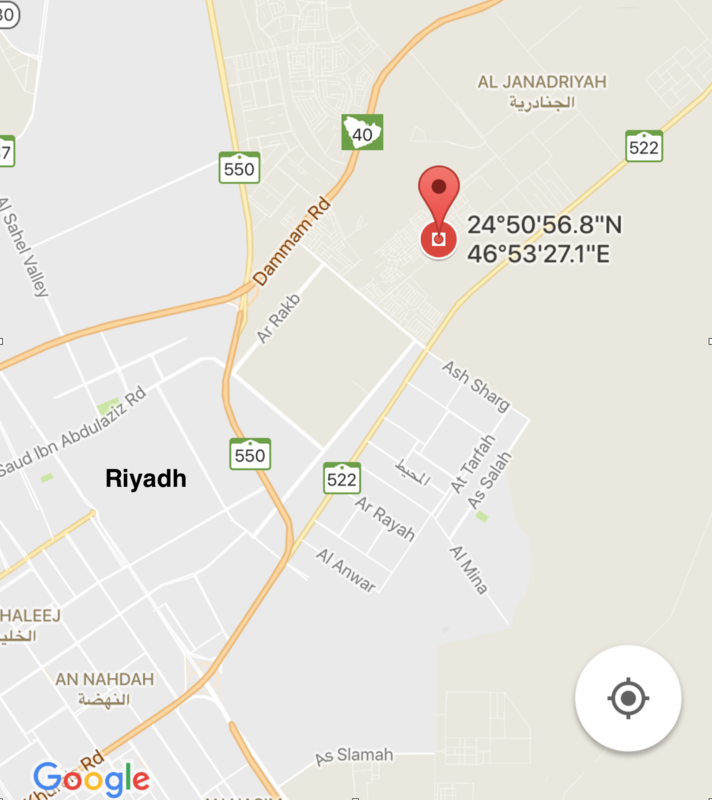 Riyadh is rapidly growing and new developments are springing up in its outskirts, which formally were in the middle of the Arabian Desert. 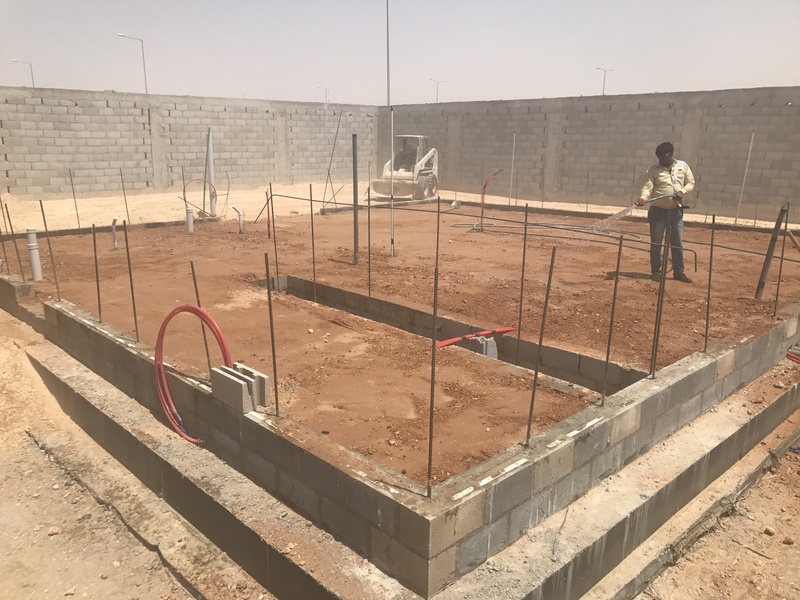 After the pad was compacted the footings were formed and the rebar placed according to the engineers from Arizona Structural in Phoenix, AZ. The footings being pumped with concrete. 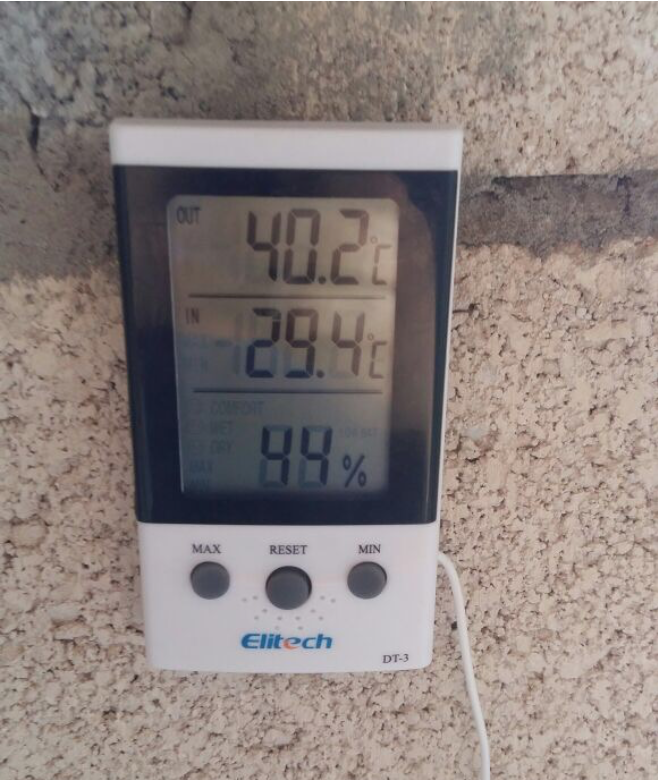 The work attire can be much different in Saudi Arabia, even when it is 115°F (46°C) most of the day. An aerial photo of the footing being poured with a concrete pump from a ready mix truck. 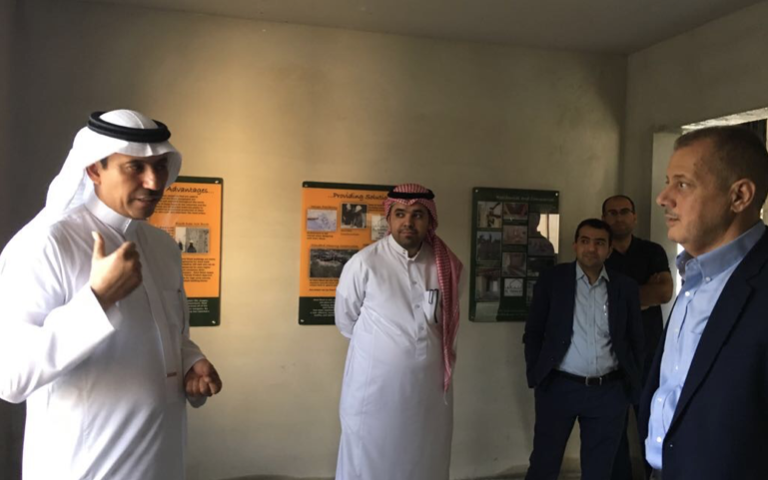 In the background the photos shows the block and insulation inserts (covered) and other building materials. This will be the model home of the 462 lot development; all earmarked for Omni Block constructed homes. Omni Block inventor and CEO, Denny Miller, is in the noticeable white shirt. Once the forms are removed the massiveness of the 30″ wide by 12″ thick footing is exposed. The interior footing is for the engineered staircase wall. The first few block… Notice the levels and especially the “line block” at the upper edge of the corner block and orange line stretched from one corner block to the other. 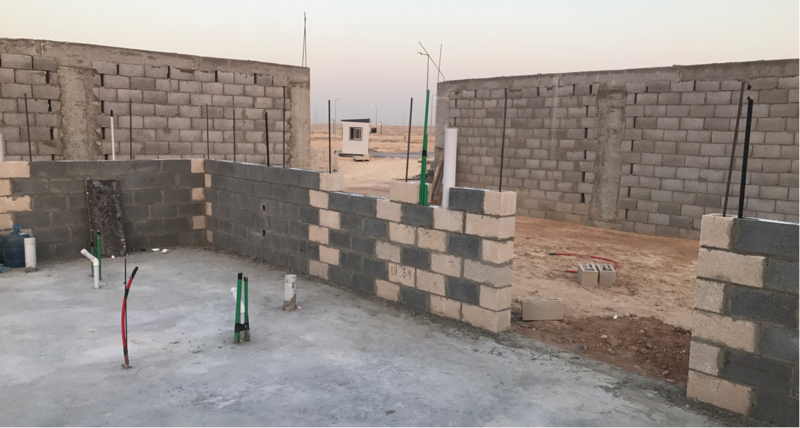 The fourth and final wall in the background required 26 block, which was expertly laid in just 32 minutes. 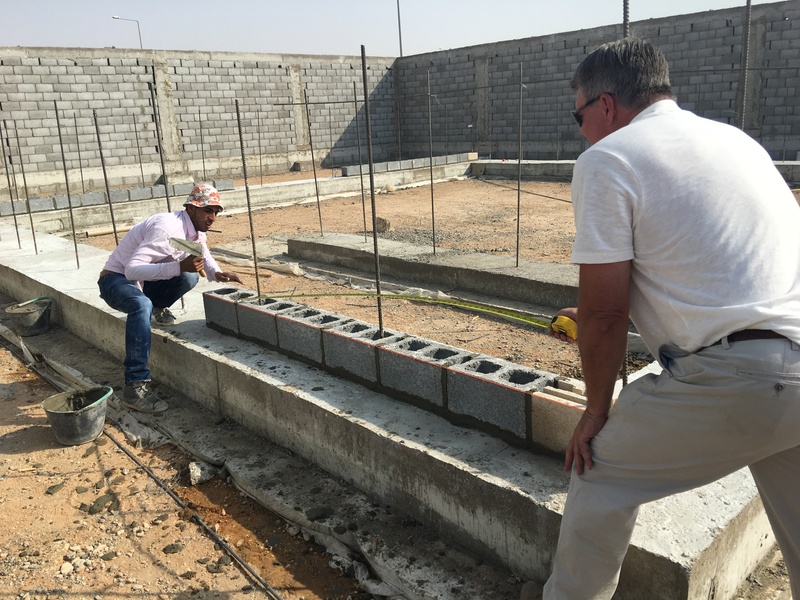 The mason, Waheed from Egypt (pink shirt) was a quick study as the second Omni Block was accurately spotted, leveled and set in place (the first is in the background). 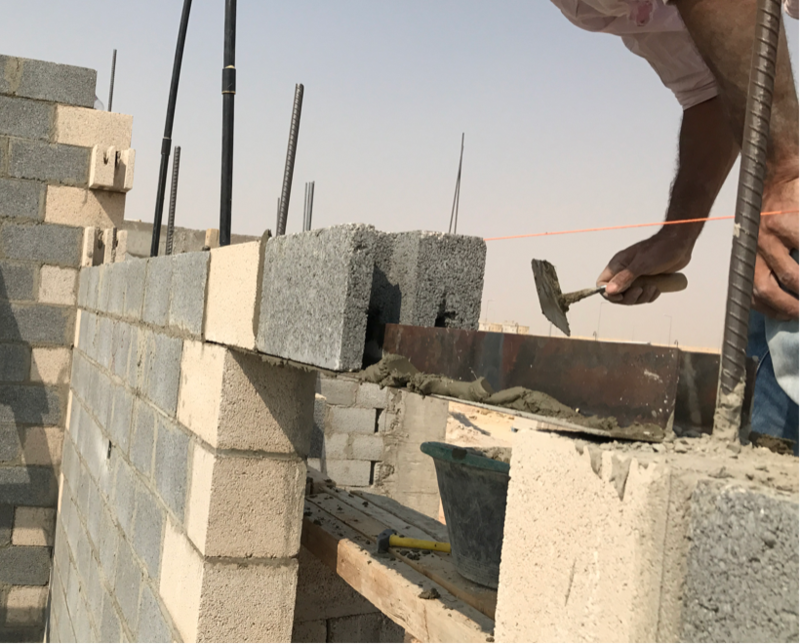 The length was measured after each block was laid to teach the mason the proper size of the vertical mortar joint and assure that block bond would be maintained so that no cuts would be required. The first course of the stem wall is completed. The open area in the rear was left out to allow for the interior backfill process. 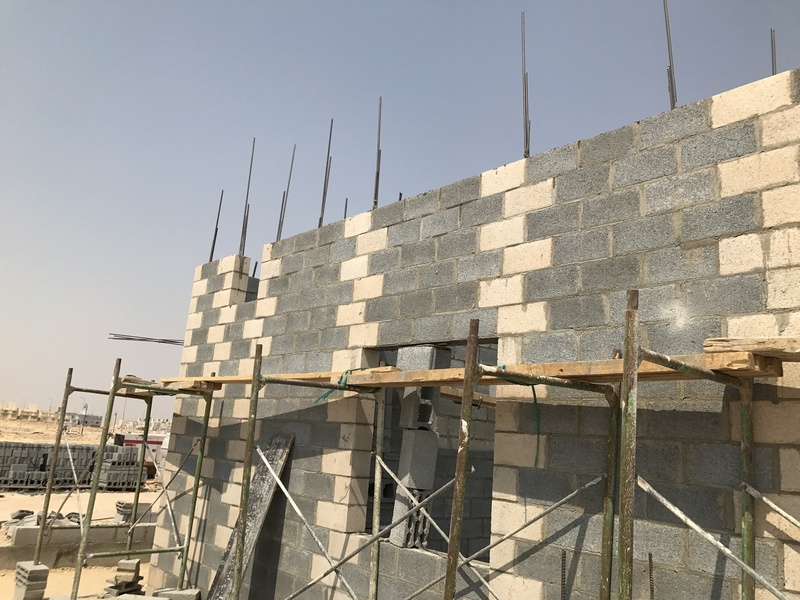 The second and final course of the stem is completed with Omni Block so that the exterior cell can be filled with insulation inserts to thermally protect the slab. 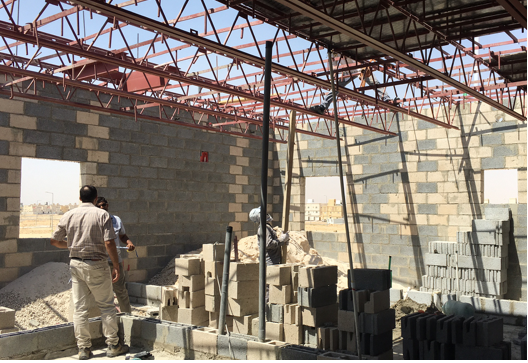 The interior cells house the horizontal bond beam rebar and then both courses are grouted solid. 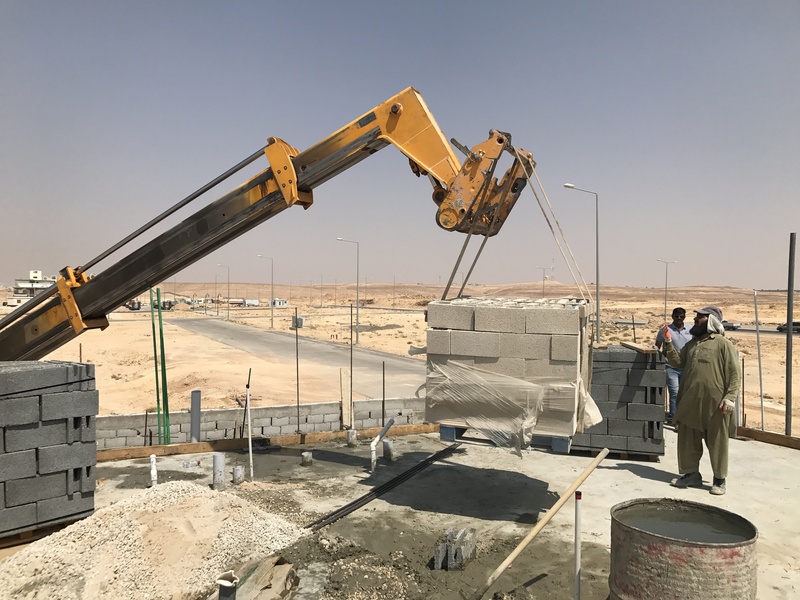 This photo captures the second ever Omni Block stretcher being laid in the Middle East. 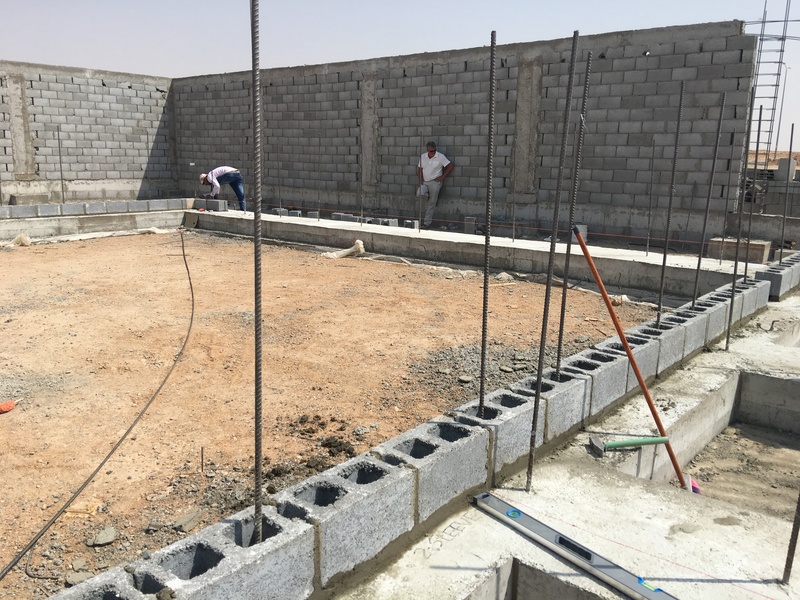 The footing has been waterproofed and the wall has had the horizontal rebar placed and is ready for grout. Since this grout pour was only going to be two courses, it was decided to “hand grout” as illustrated above. 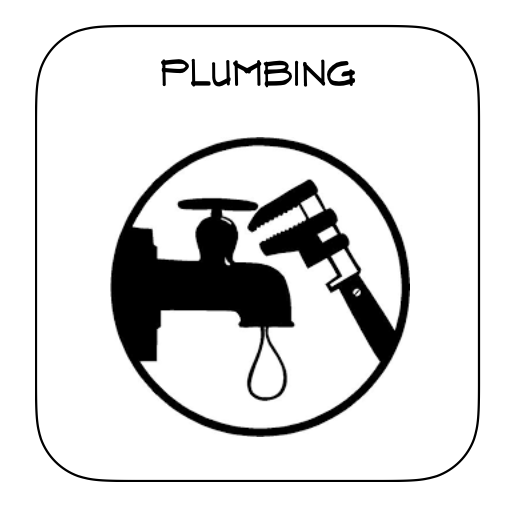 Mechanical – Electrical – Plumbing subcontractor placing all of the underground piping and conduit. This entire process took only 2.5 hours to complete. 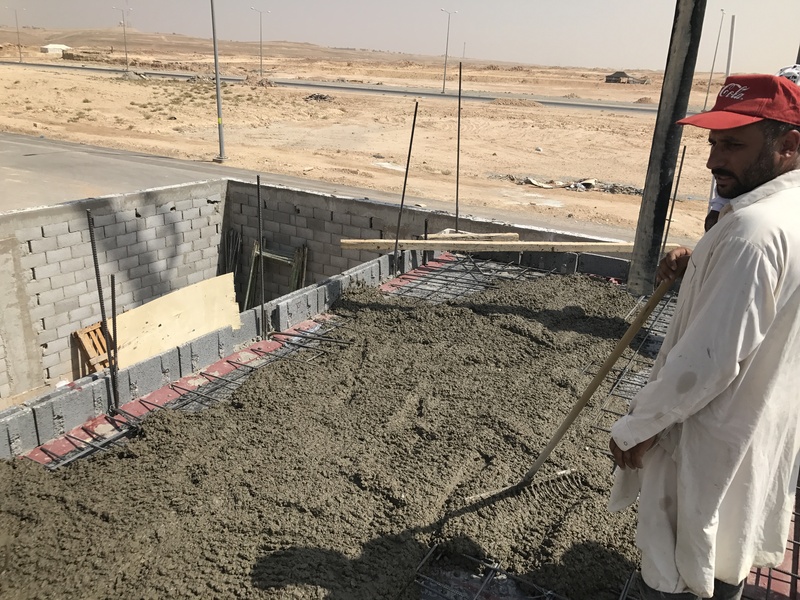 Project foreman Nadeem Ahmed adding water to the soil after the MEP work and prior to the vapor barrier, rebar mesh and the concrete slab being poured. 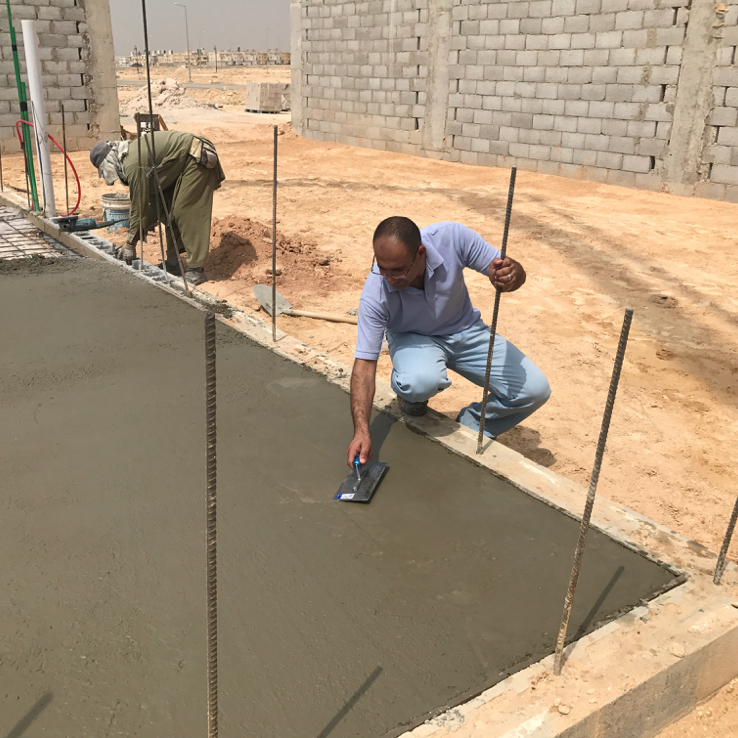 A laser level is used to accurately mark various level points within the concrete slab. 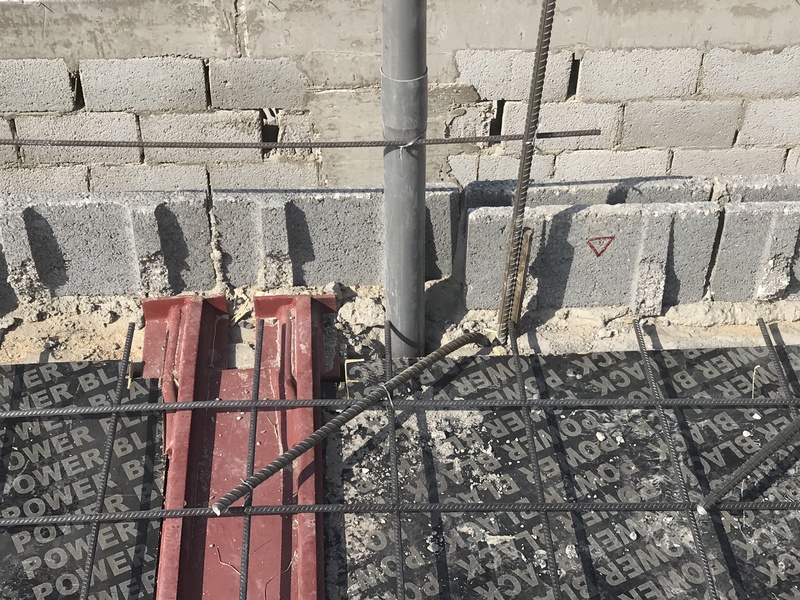 Notice that a vapor barrier is under the reinforcement grid, which is suspended above the compacted soil. 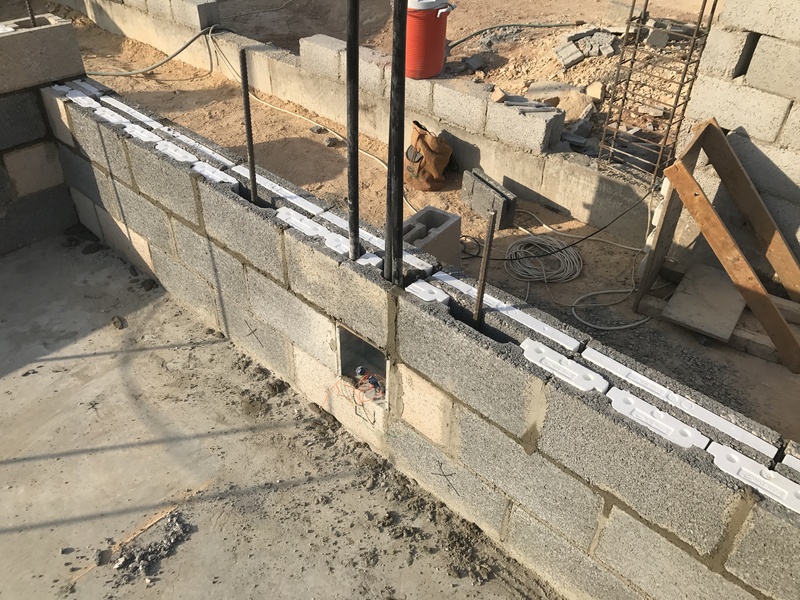 The expansion padding around the perimeter is installed while the deeper area is where the staircase wall is called for, so this pour is directly above its respective footing below. 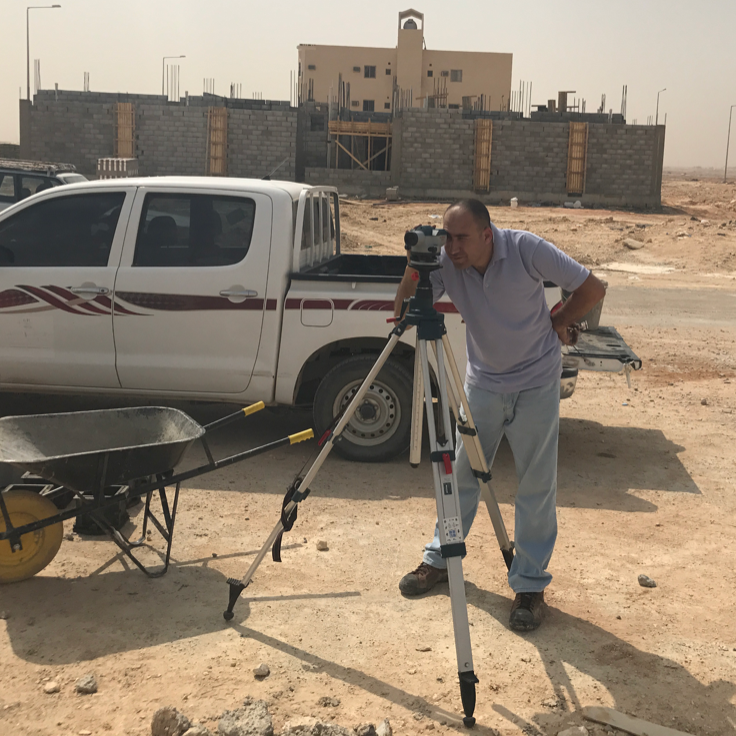 Project Supervisor and Site Engineer Mohammed AlNatur shoots in desired floor heights using a laser level. 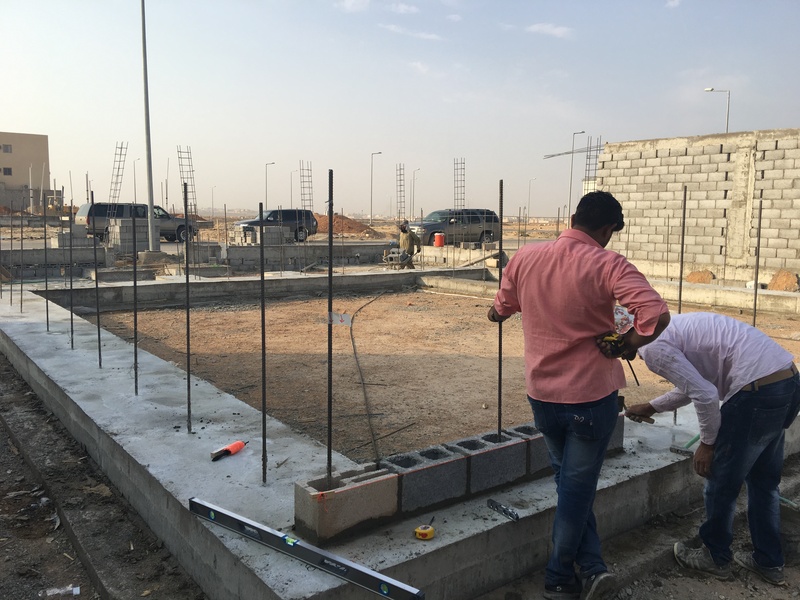 The concrete crew methodically levels concrete using the internal markings on temporary rebar sticks and plumbing embeds. 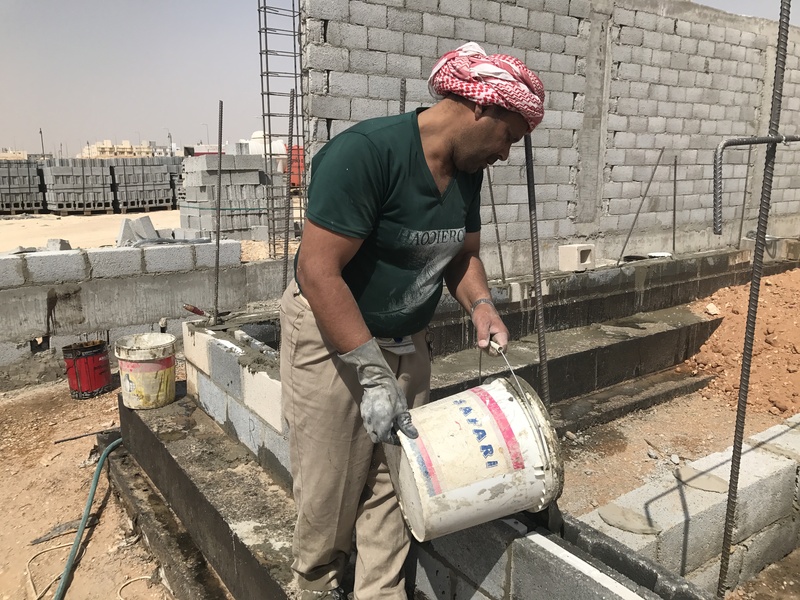 Pouring the slab to the top of the stem allows the future tile to be thin-set right to slab eliminating the customary sand bed tile installation. The thin-set technique is quicker, less costly while providing the same desired look. 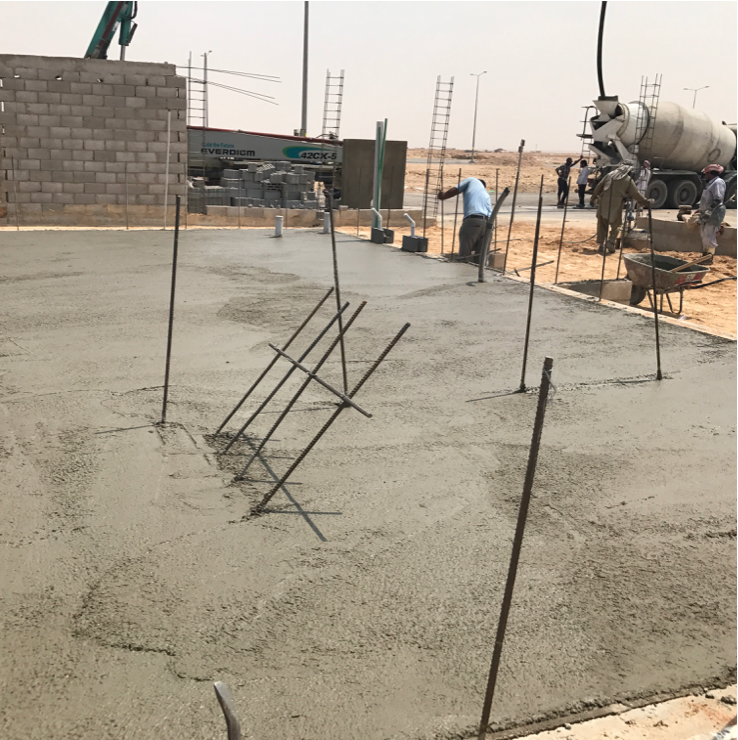 The concrete is setting up and will be finished semi-smooth to allow for a tight bond between the concrete and the future tile adhesive. 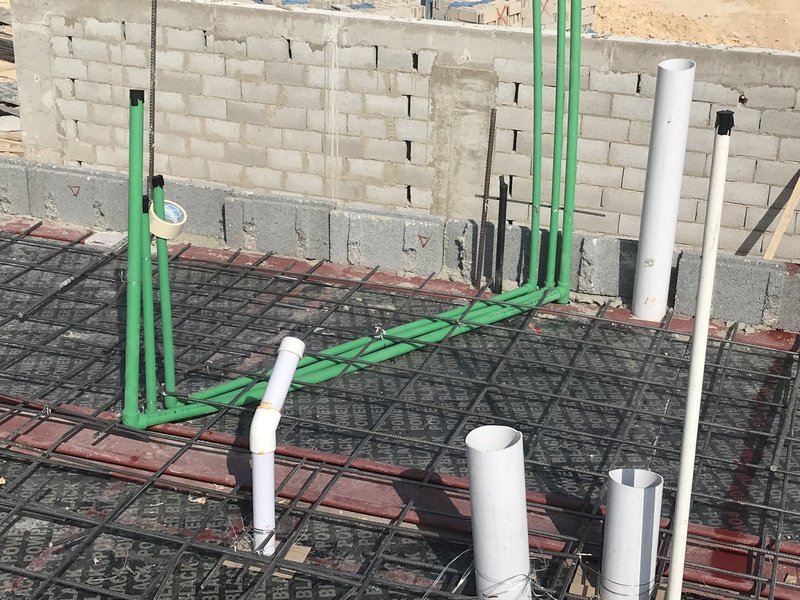 The four angled rebar in the foreground are structural rebar for the engineered staircase. 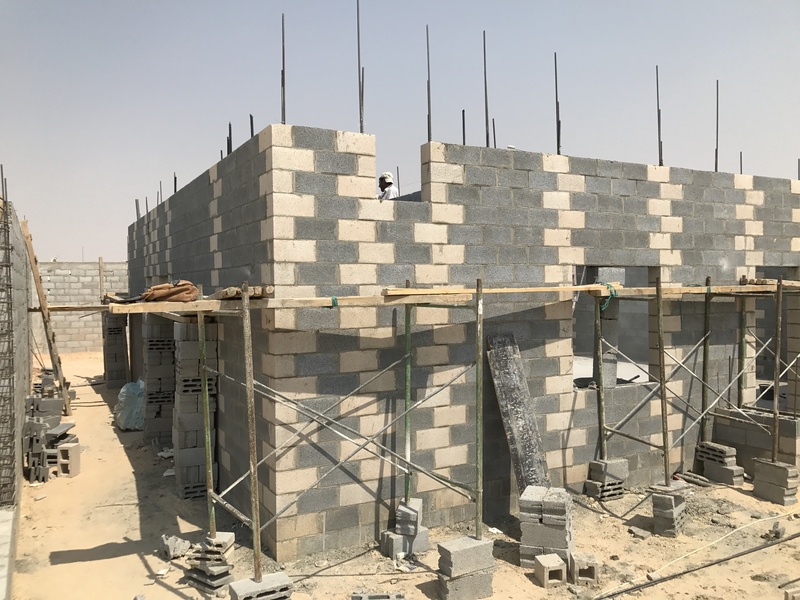 The Al-Tahaluf Villa goes vertical! The first course of the ground floor begins. Notice that he is wearing a new Omni Block shirt. He was given a few gifts in exchange for his “beloved” plumb bob tool that they normally use in lieu of a level. Others were given the shirts as Omni Block also supplied new levels, hammers and string lines. These tools along with some block laying instruction are why the walls are level, plumb and straight. The photo shows an example of the under slab embeds now coming up in the desired location within the wall. This box will house the low voltage cabling and the black vertical conduits will run up the wall and into the ceiling truss areas. The wiring is then pulled and connected throughout the house. 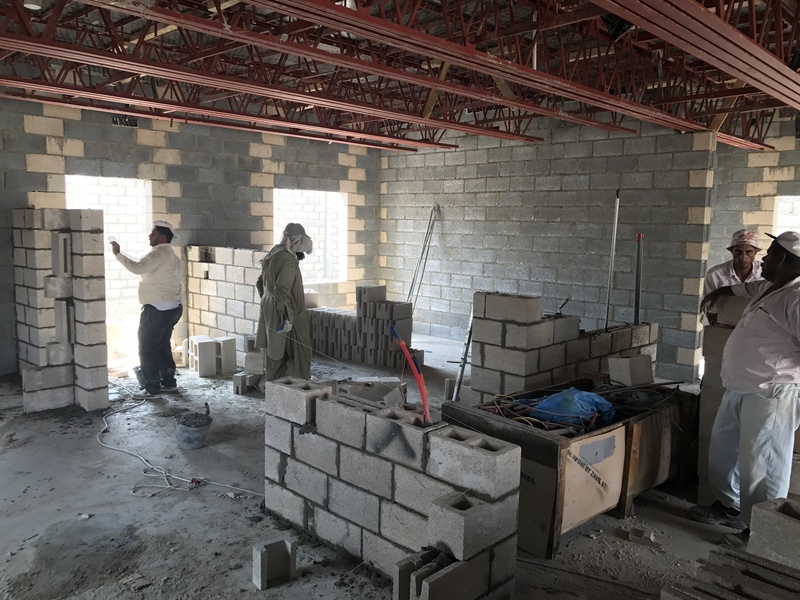 The box is flush, as is all of the electrical boxes, so that a thin layer of plaster that is primed, puttied and painted is all that is required to finish the wall. 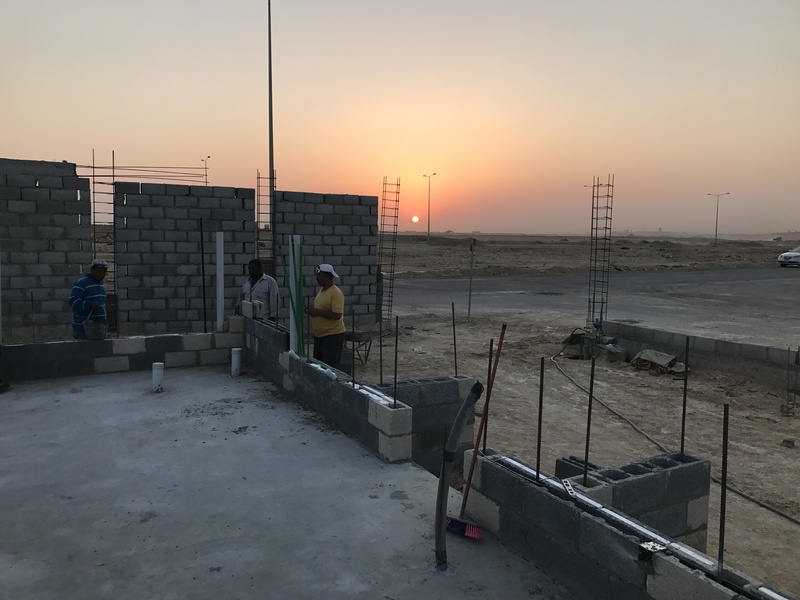 As the sun rises over the Arabian Desert, a couple of additional masons are set to be trained for the “Omni Block Way” as it is now called in Riyadh. 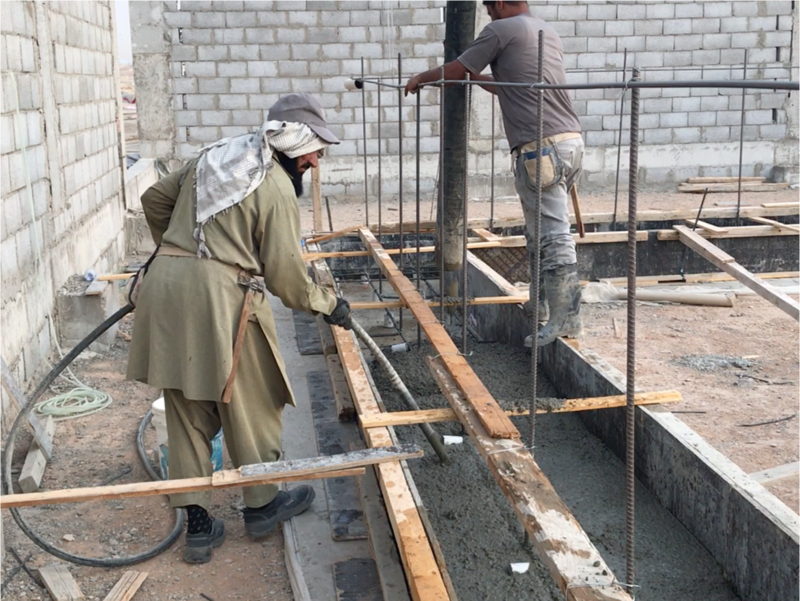 This is the first photo posted of how smooth and level the concrete floor was poured. 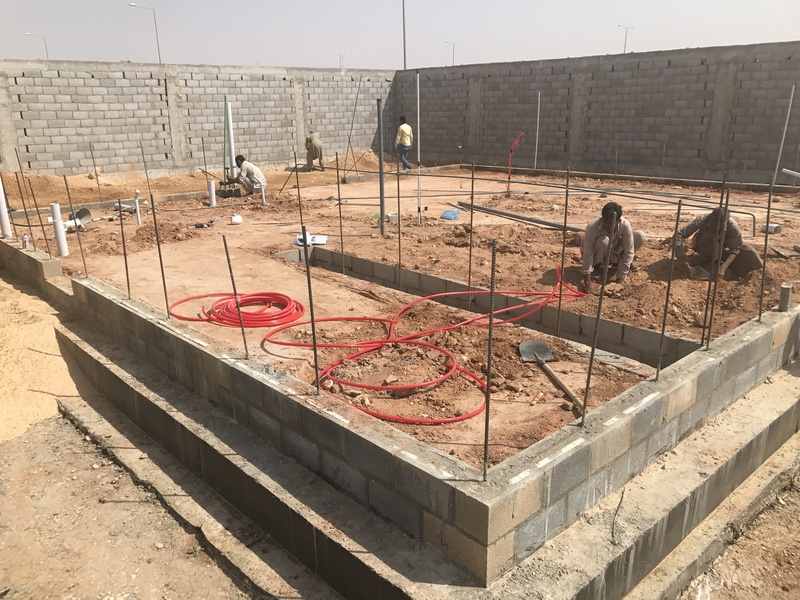 The first 6 courses go up quickly and contain electrical (boxes and black conduit) and plumbing (green conduit and white sewer pipe) embeds. The lighter colored block are Omni left and right corner/jamb block and are used at all corners and window and door jambs. They are also used to house the sewer pipe by alternating a left and then a right up the wall. 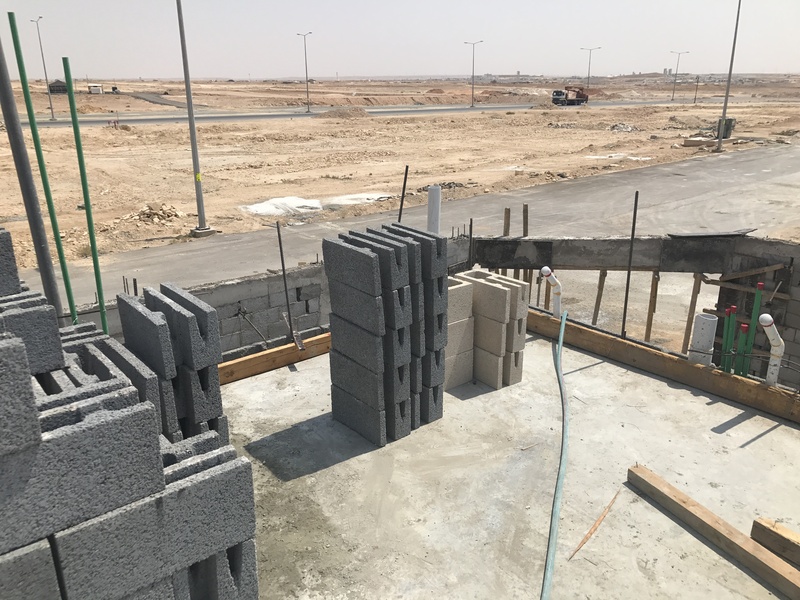 The grey block are the stretcher block and were made in Saudi Arabia by Saudi Readymix to ASTM C-90 and C-140 standards so are “structural” block. 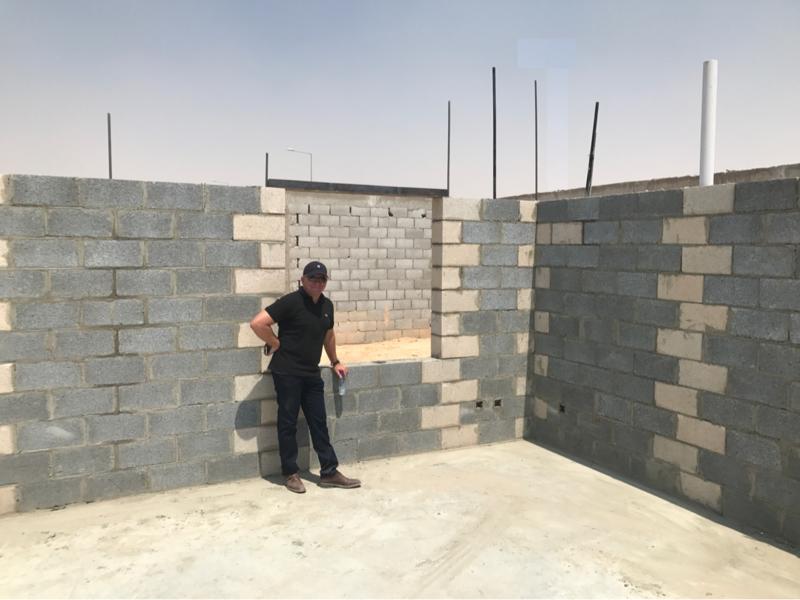 Builder Robert Hofmann, CEO of Saudi based Al-Tahaluf, shown here with his villa eleven courses completed, which is the cross-over height for all windows and doors. The steel lintel is in place above the shown window. 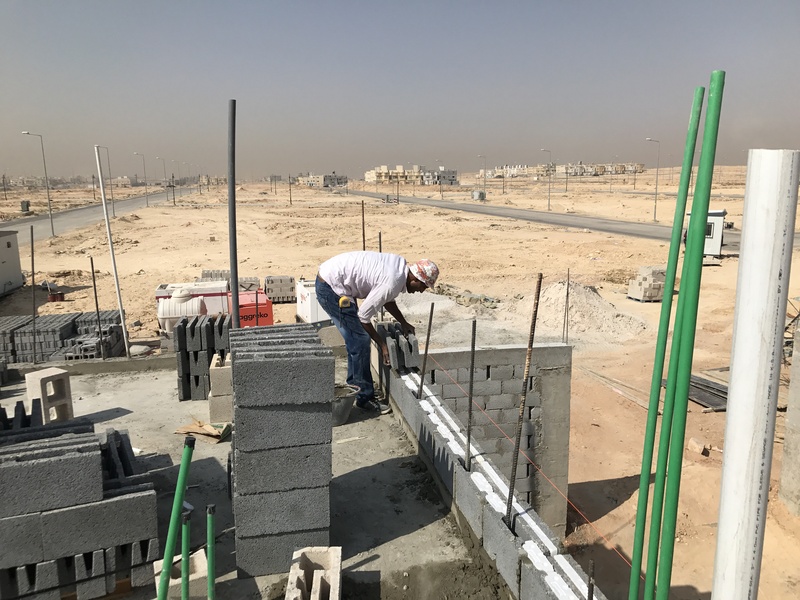 “This is the cleanest, highest quality and quickest block system in all of Saudi Arabia and I have been doing this a very long time here. 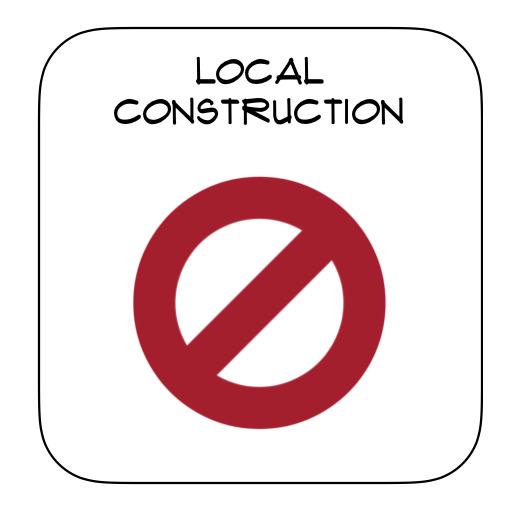 The fact that it is also insulated is just icing on the cake,” stated Rob at the site August 30. 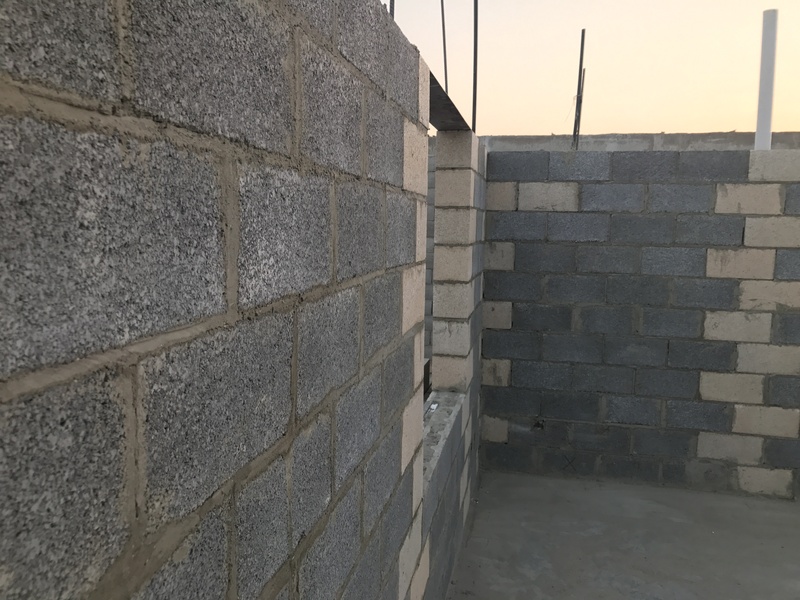 One of the advantages to the “Omni Block Way” is that walls are plumb, straight, and openings are accurately dimensioned per the building plan set. 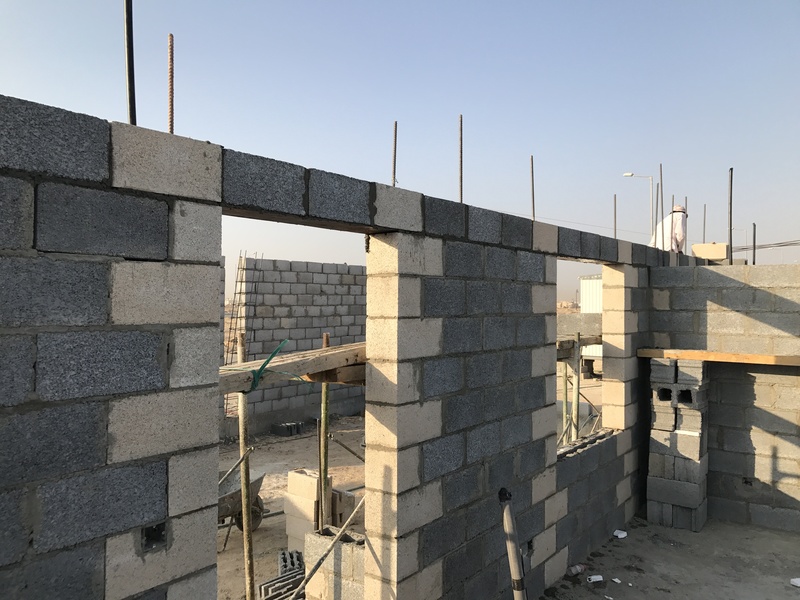 The photos above illustrate how plumb the block for the window openings is set. This is done by sighting the edges of the left and right vertical edges of the future window. The spacing between the edges remain parallel to one another in both photos. There are 8 openings at the ground floor level and each were as plumb as these two. 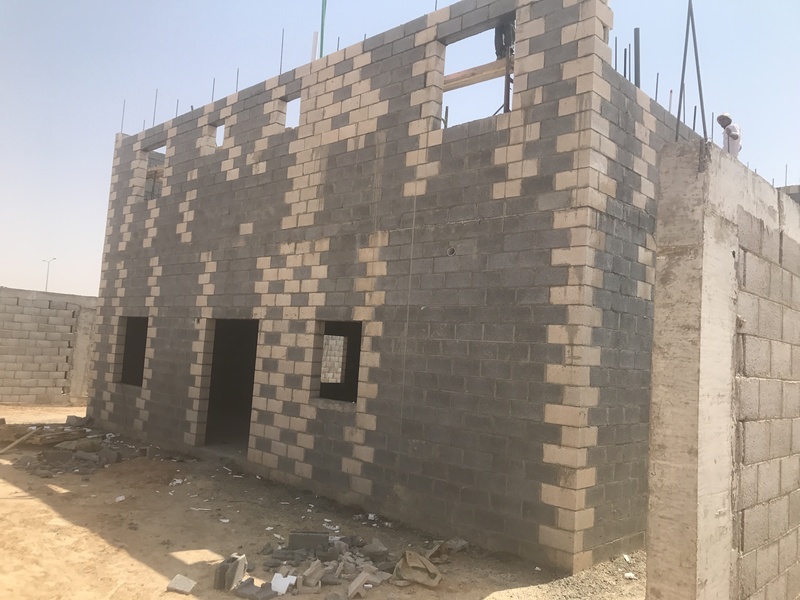 The prefabricated steel lintels are designed so that they can be set above all the openings and bear 10cm on each side. 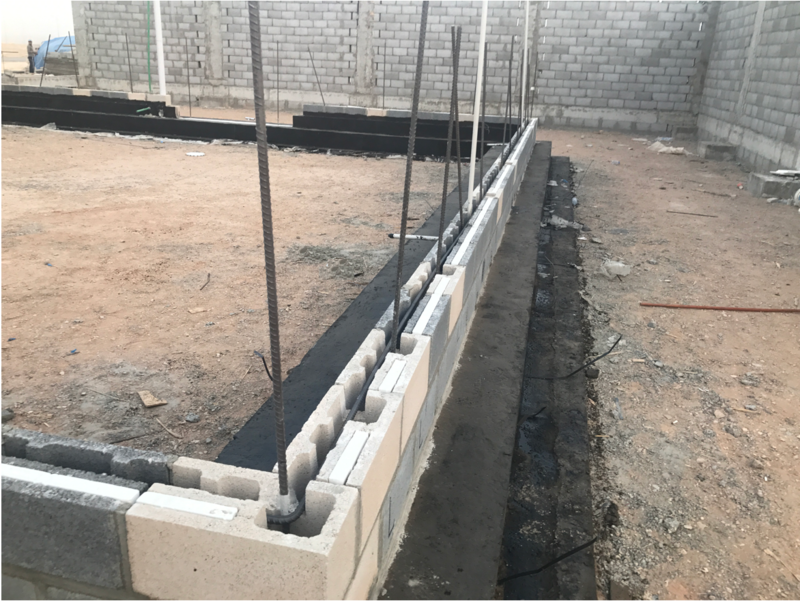 Integrated columns with rebar and grout are adjacent to each side of each opening and are also spaced approximately one meter apart between any openings. 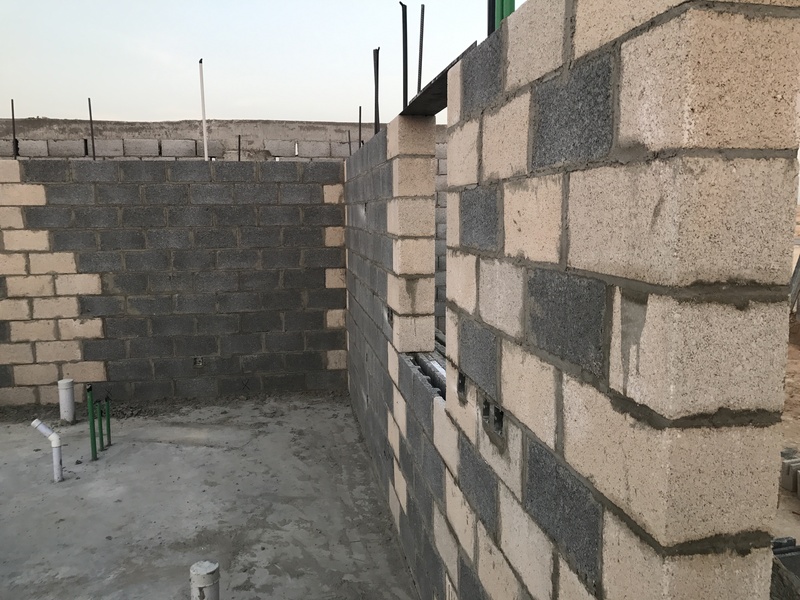 Omni Block’s corner and stretcher block are inverted (turned upside down) and the V’s of the Omni Block design sit over the top of the lintel’s double structural vertical membranes. The result is that block is laid practically as fast as if laying it on another course of block. No forming with wood is required. 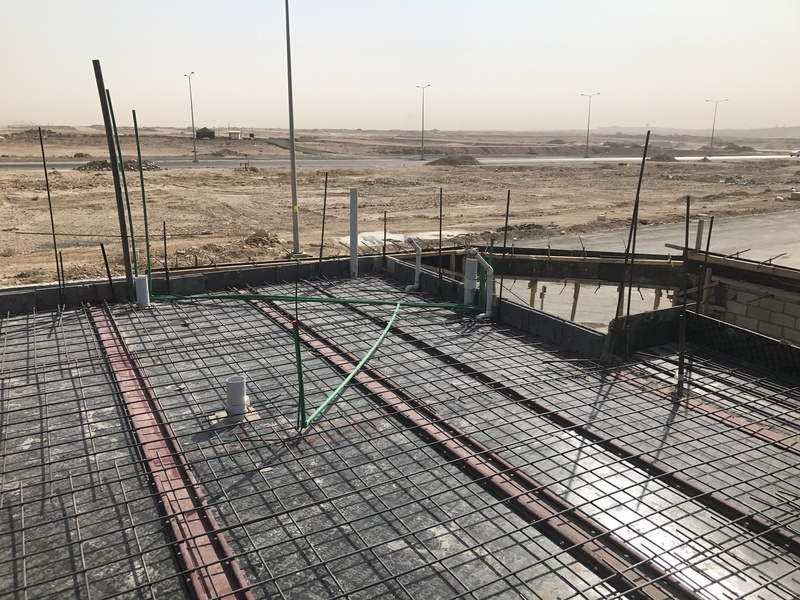 The “crossover course” is laid then a course above where the interior cell is left void for horizontal rebar to be laid within. This rebar extends to the adjacent vertical cells on each side of the opening and then grouted. The villa front view 17 courses completed by construction day 9. 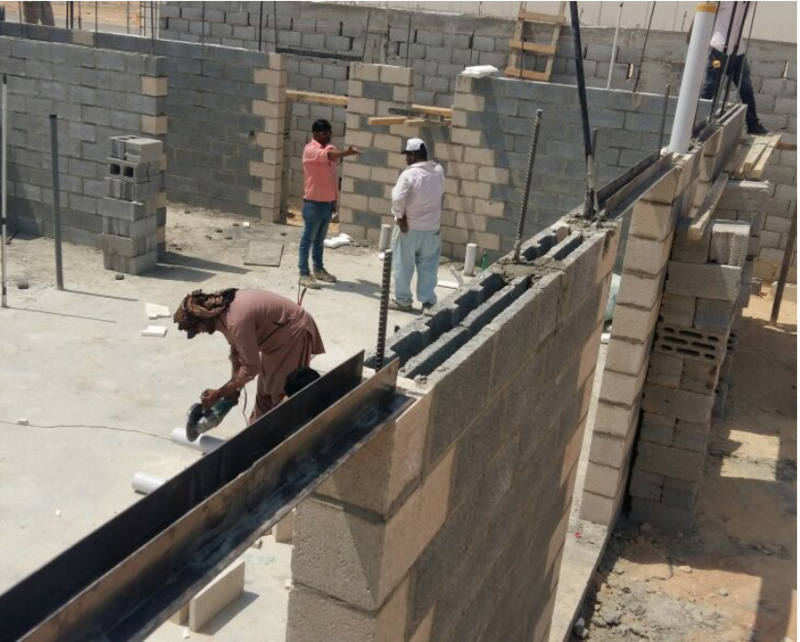 The heights of all walls were verified to be 3.4 meters, which is what 17 courses of block should measure at. All window and door openings were verified to be the size opening specified on the plan set. The front left view of the villa up 17 courses. The job site remains remarkably clean as these construction photos are not “staged” in any way. Flying trusses over the villa! 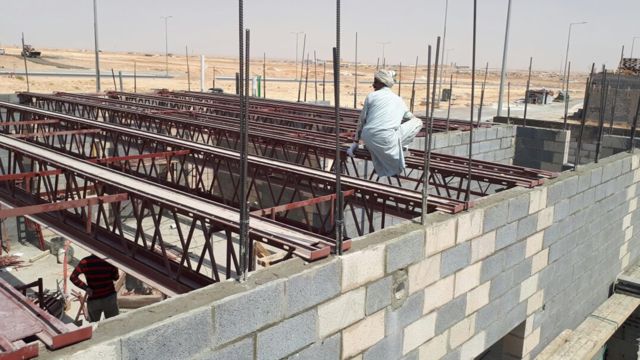 Reinforced steel trusses engineered by Hambro and manufactured by Zamil Steel of the UAE are ready to be placed. The installation crew sets the trusses per engineered drawings. 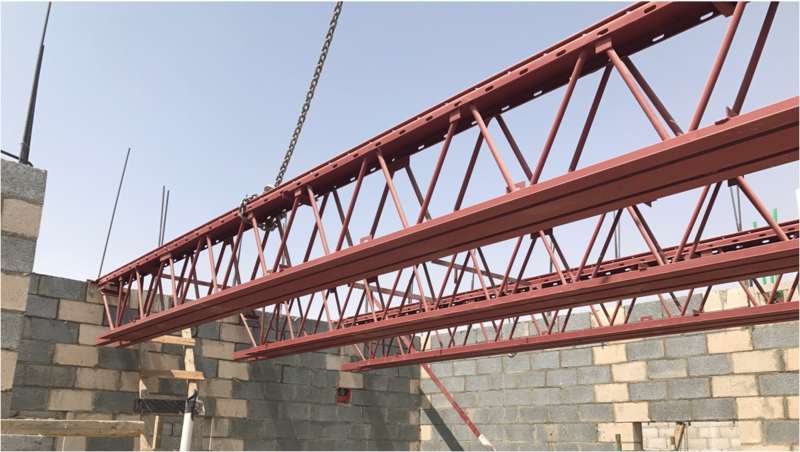 A specific width is maintained by precisely dimensioned roll-bars that are locked into place between the trusses. 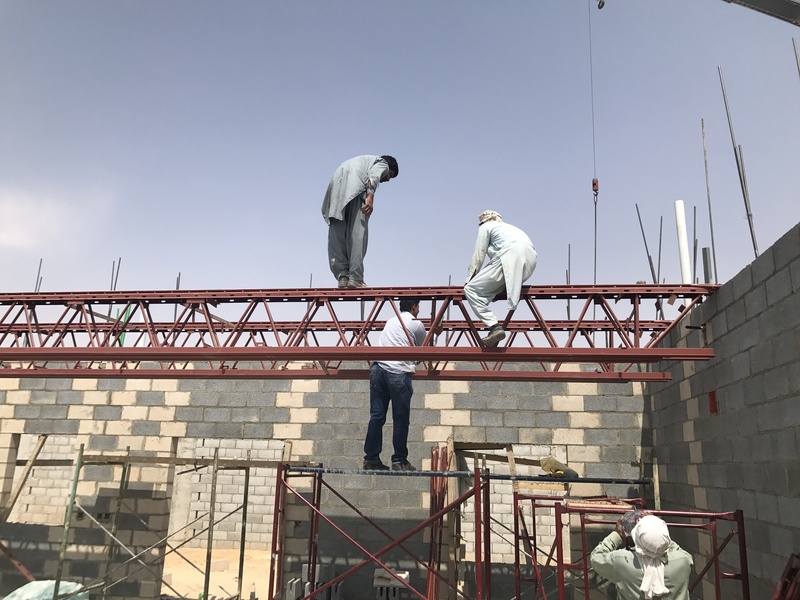 The trusses are spaced 115cm apart from one another and provide the structural strength to span the 12 meter wide building without any structural columns. 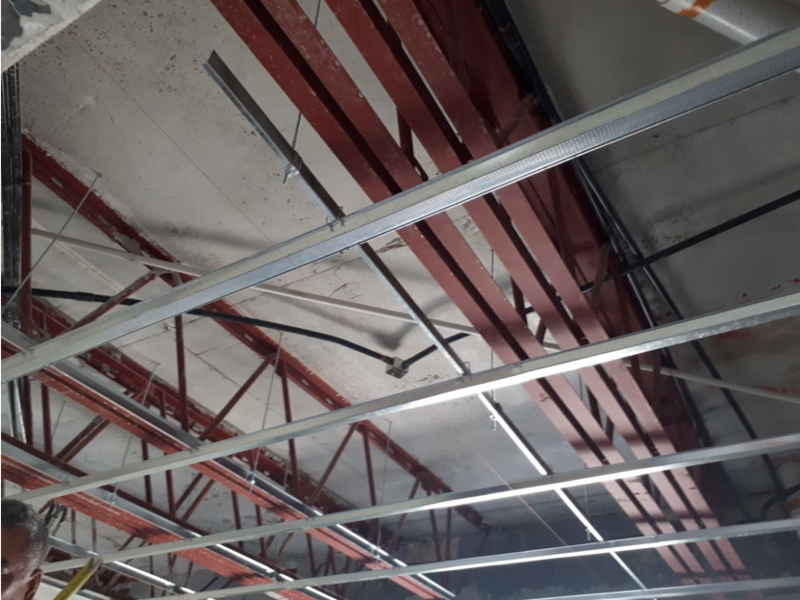 These are the same type of structural trusses that are used in large gymnasiums and other buildings that do not allow columns to be used. A total of 9 trusses are required per the engineering of this villa. 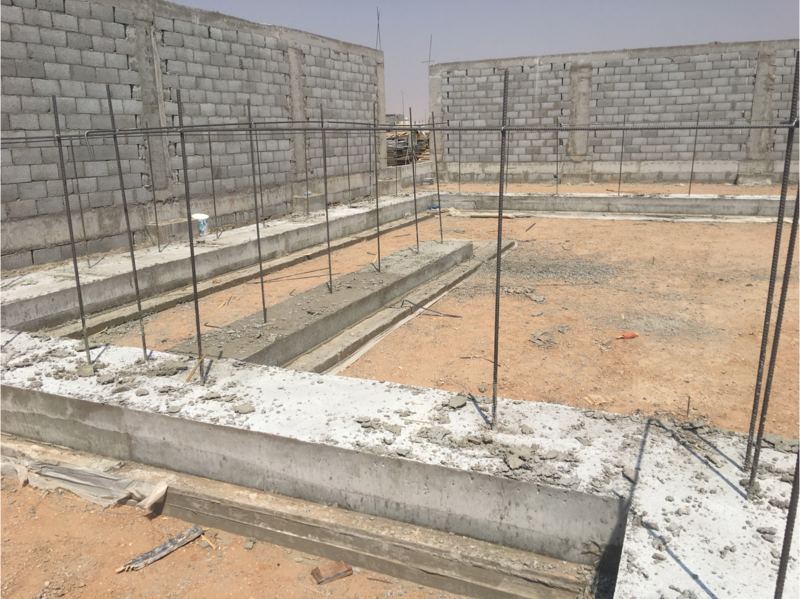 These 9 trusses will carry the 10cm concrete floor and will allow the placement of the first floor block walls in any desired location. 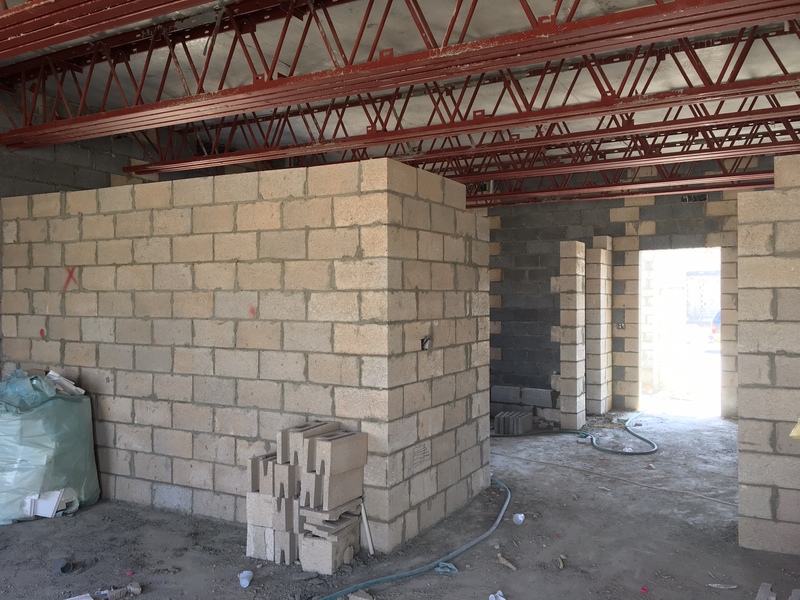 The interior non-loadbearing concrete block wall locations can be changed to accommodate a new homeowners wishes. There are a number of advantages when using the Hambro flooring system. The ground floor is completely open with no bracing required. 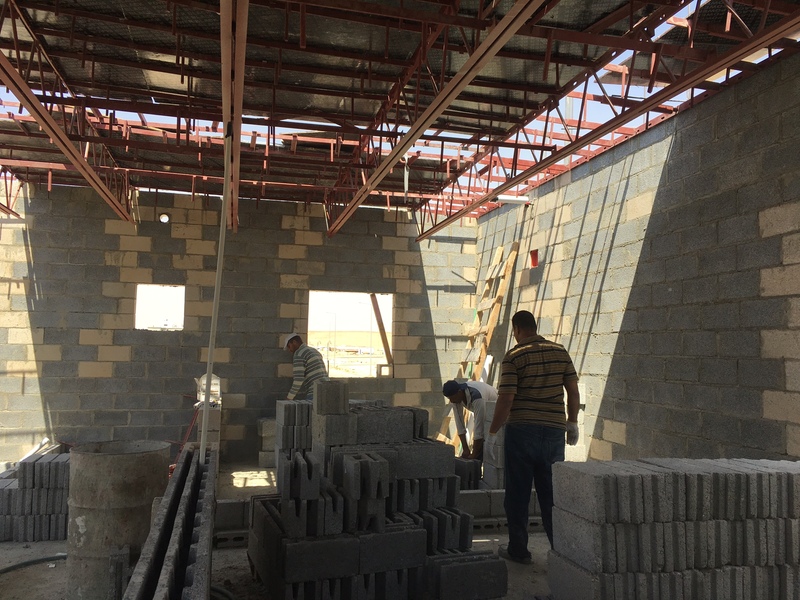 Interior block walls could be going up simultaneously with the first floor work above. 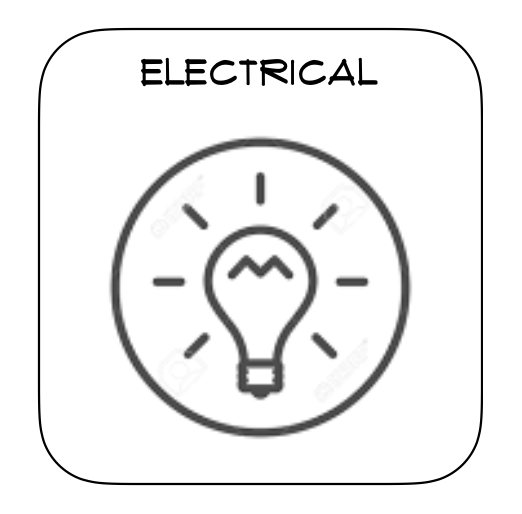 Electricians and plumbers can begin running wire within the conduit and plumbers can also extend interior ground floor piping. The open webbing of the truss lets the mechanical, electrical, and plumbing be swept out of the block wall using 90° sweeps. This provides considerably more flexibility than with other ceiling/floor systems. 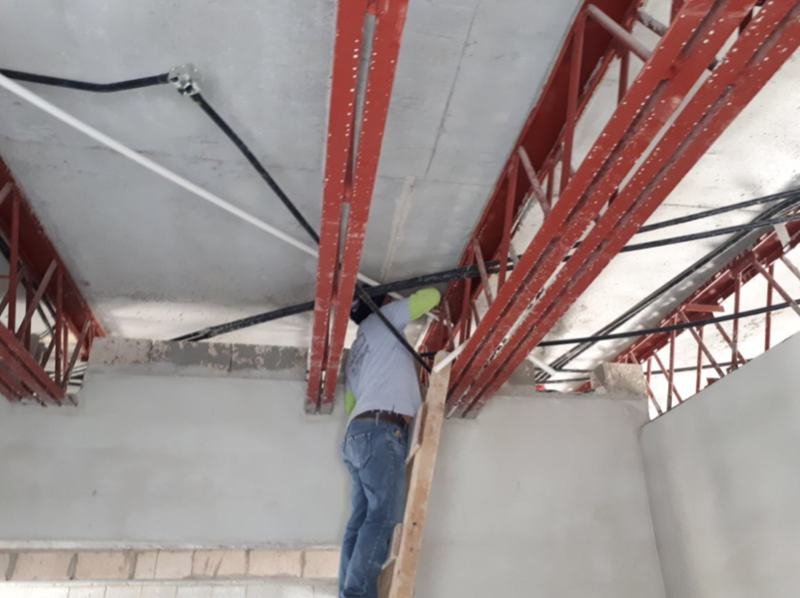 Notice that the plywood is set above the roll bars that are all the same length as to keep the trusses evenly spaced and are removed after the concrete cures. The plywood is reusable. 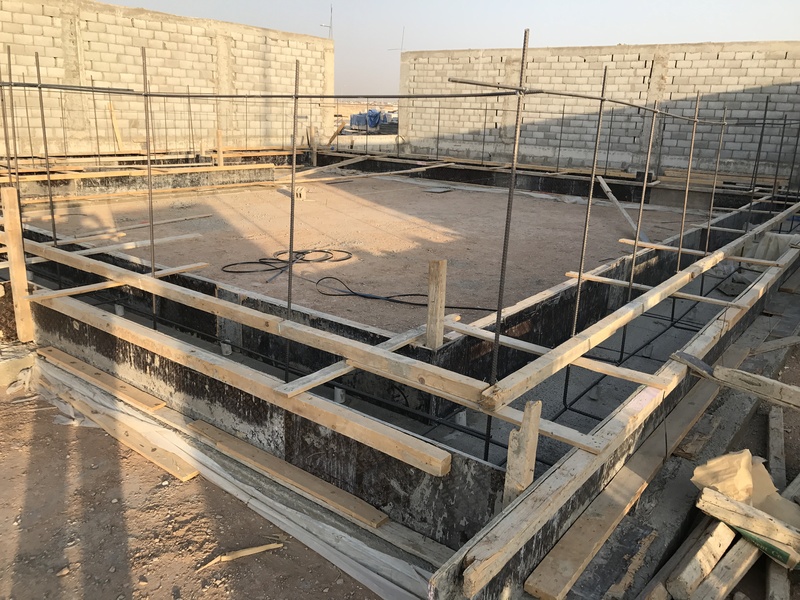 The view of the first floor before the 10cm concrete pour. The same mesh that was used in the slab is used in the subsequent floors. The electrical and plumbing embeds are in place before the pour. 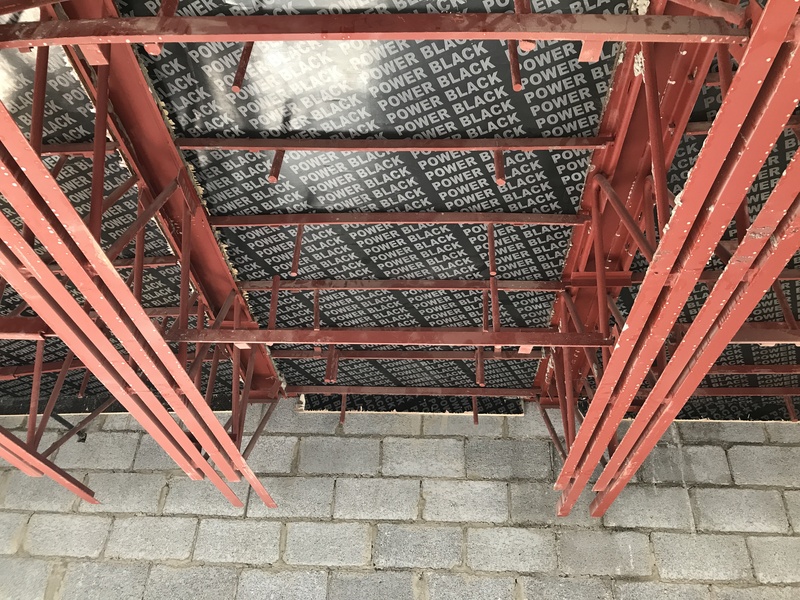 The Hambro trusses bear 10cm (4″) on the 40cm bond beam (fully grouted with horizontal rebar). The trusses have a small lip that the plywood rests on. The system is completely engineered. 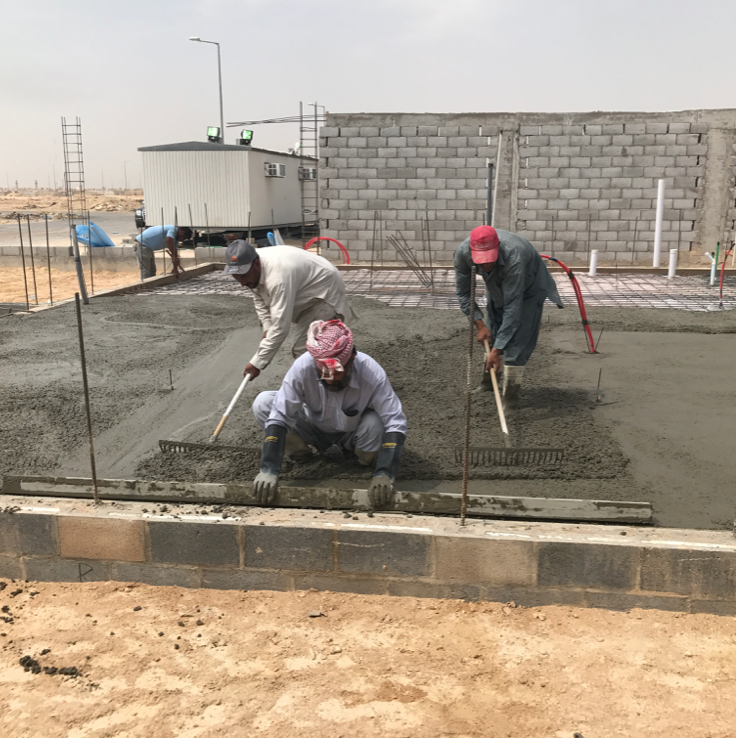 The floor was poured on Thursday and 8 pallets of block (32,000 lbs), sand, gravel and cement were loaded onto it on Saturday. 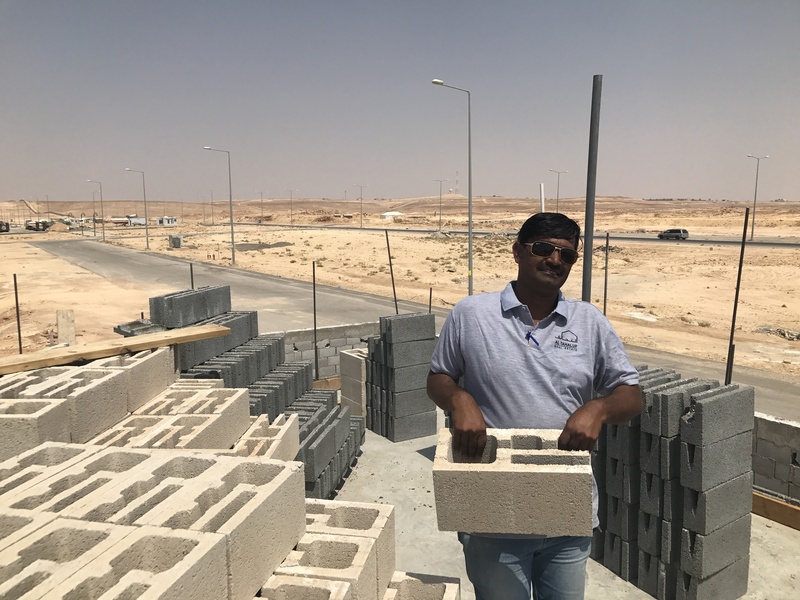 Nadeem, Project Foreman, provides a hands-on demonstration of how to stock the walls by properly placing the corner block. 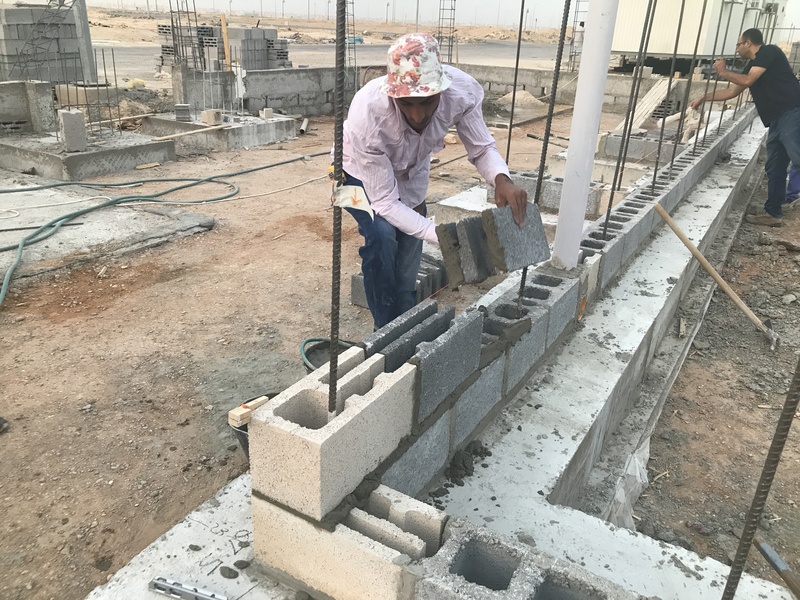 The block is uniformly stocked so that the stretcher block are all facing the same direction, which allows the mason to always pick the block up the same way and lay the block with minimal time-wasting block handling. The corner blocks are also stocked so that the mason is not delayed in any way. 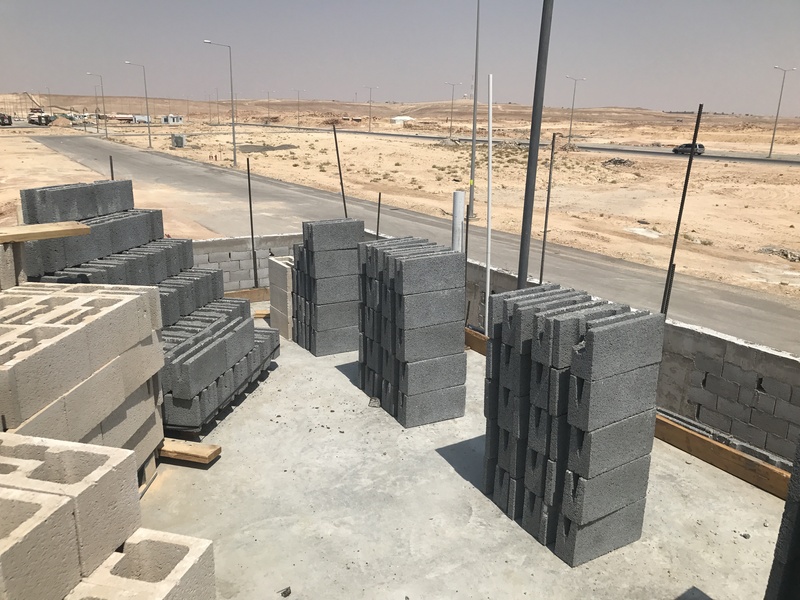 Production is key when it comes to laying block so proper quantities, spacing, and proper stacking all add to facilitating a very high daily “laid block count”. The first floor begins with the first course. All rebar is in its proper place from the extended previous ground floor locations. 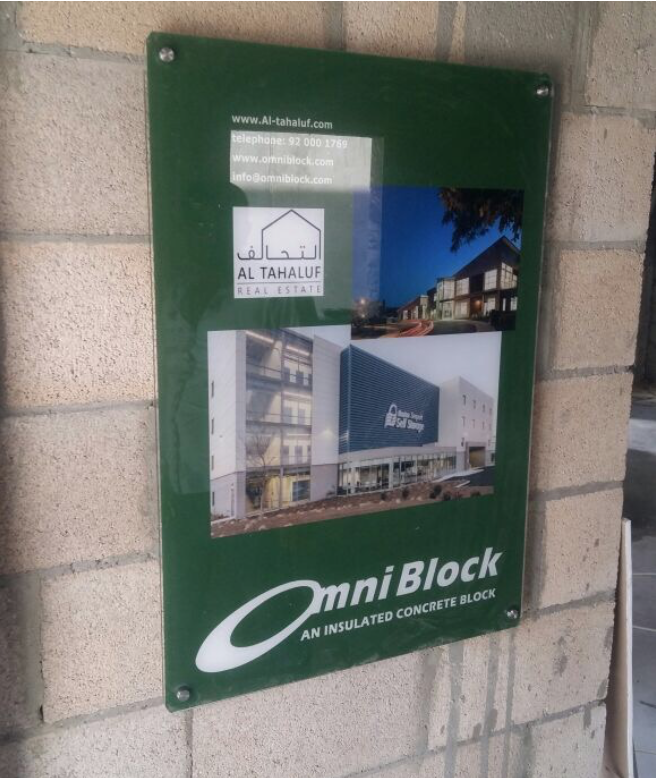 Omni Block has been used in 7-story buildings; each floor a duplication of the previous floor’s installation process. The opposite view of the rear wall of the villa. Two masons and 3 helpers laid a little over 500 block in one day. 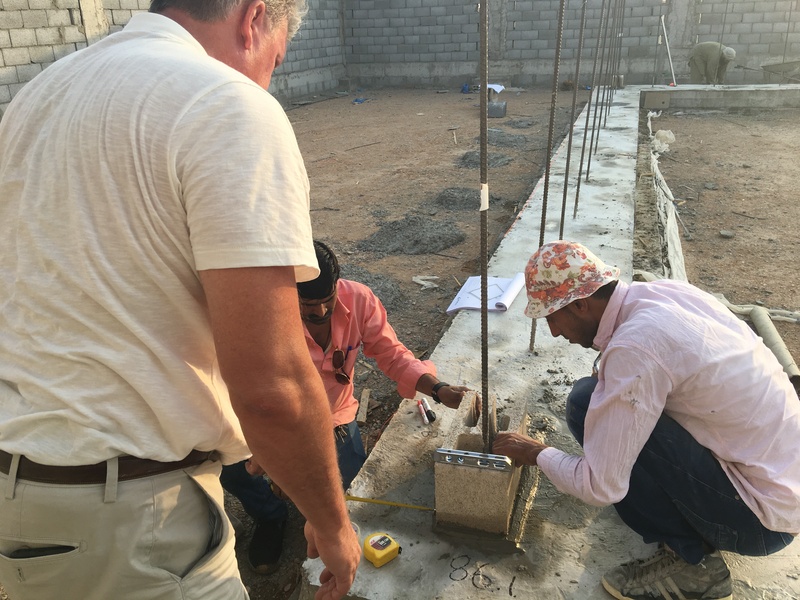 The next day 4 masons, 4 helpers laid 829 block, which was about 20% of the entire villa’s block count. This view is of the villa’s rear wall. 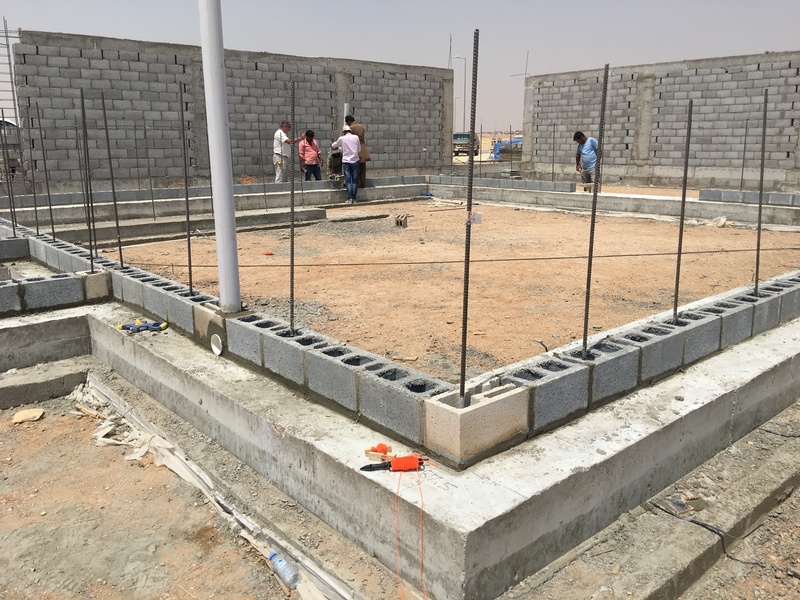 Walls are plumb and each course is level. 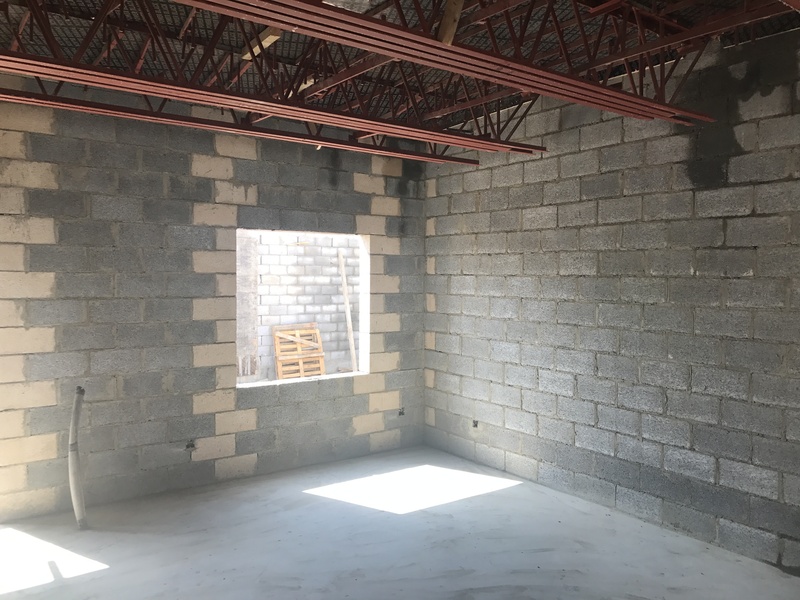 Window openings are precise and plumb and level. 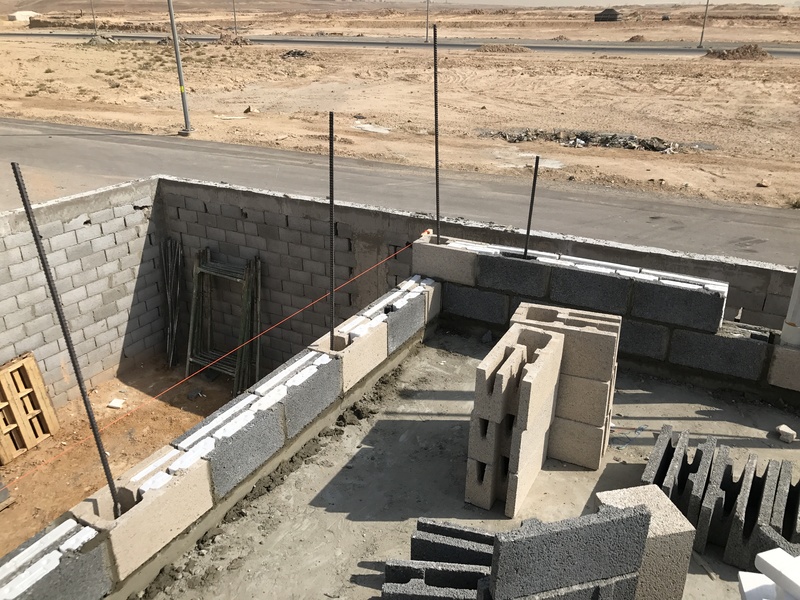 The villa (within the privacy wall) showing that Omni Block is complete. 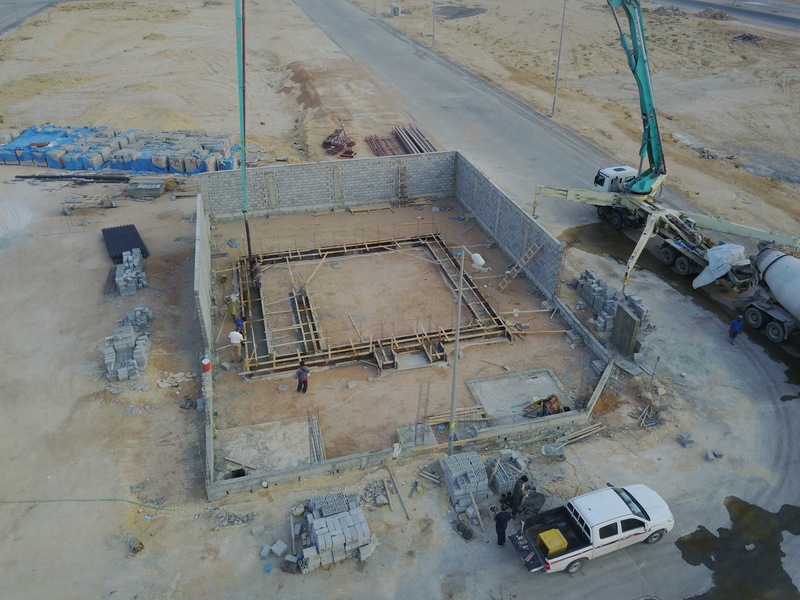 Vertical rebar is placed in the designated cells, and the two top courses each contain 2 Number 5 horizontal rebar. All are solid grouted. 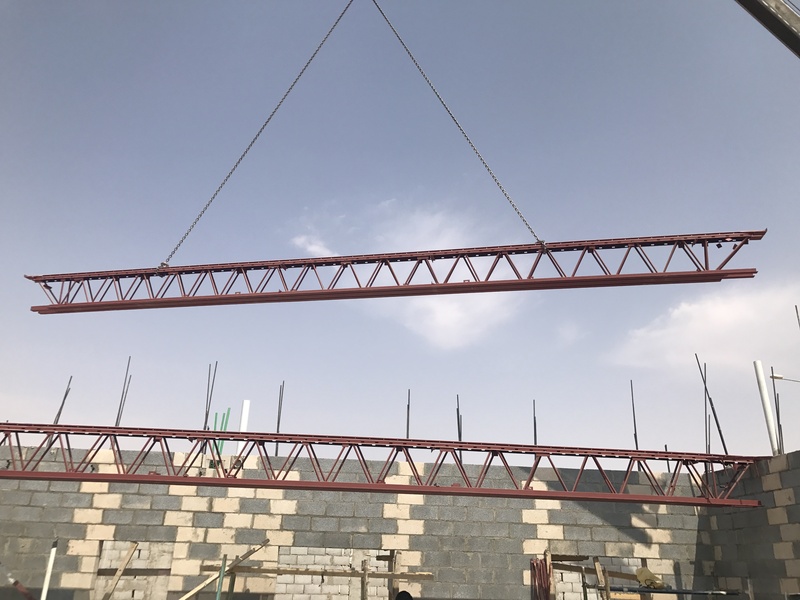 An advantage of the steel truss system is that while work is going on up on the first floor, work can immediately continue on the ground floor. 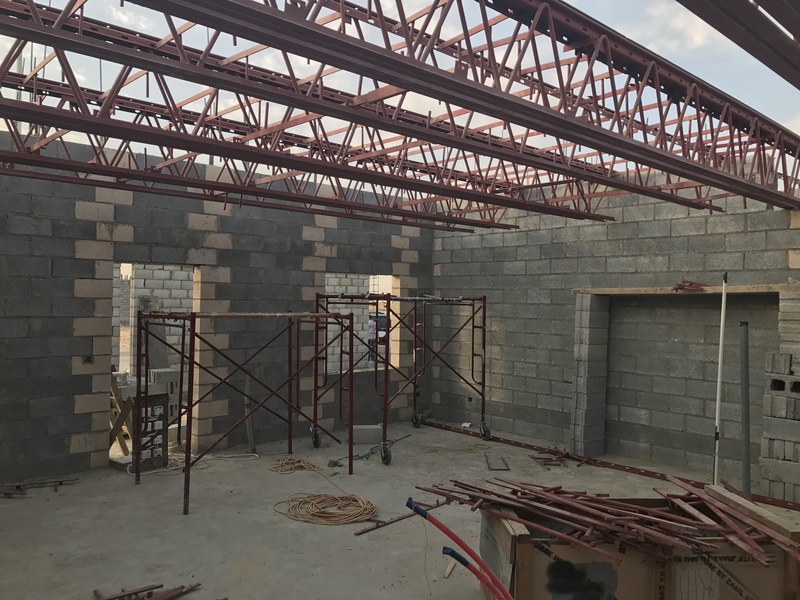 Photo shows the interior walls of the ground floor completed in a single day by 2 masons, while the first floor is being topped out and getting grouted in preparation for the steel trusses. First floor steel trusses are set and the reusable plywood is being set into place above the trusses. 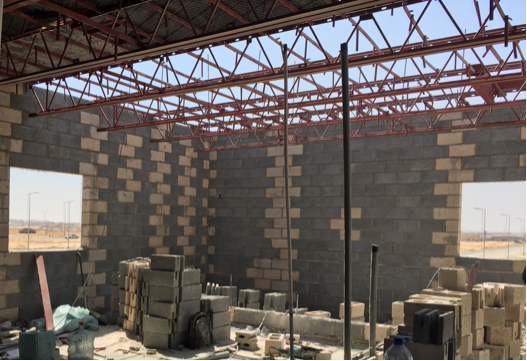 First floor interior masonry walls are being done while the steel truss work is being completed. 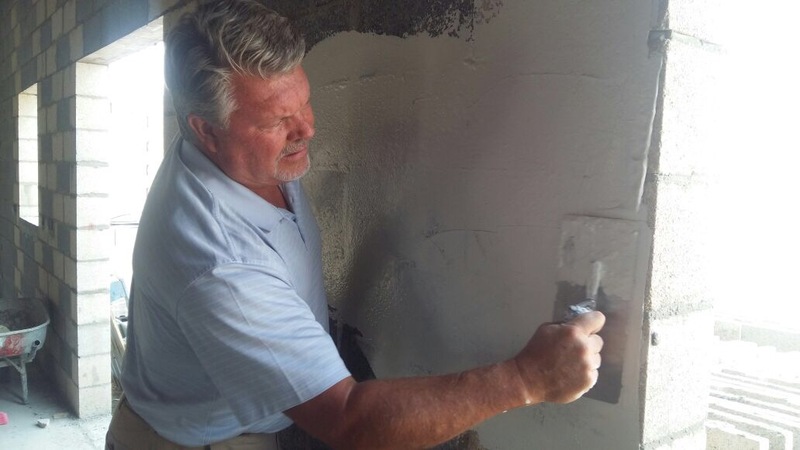 Omni Block inventor Denny Miller demonstrates how to apply a base coat of joint compound directly over the block. A finish coat is required then the wall can be primed and painted. 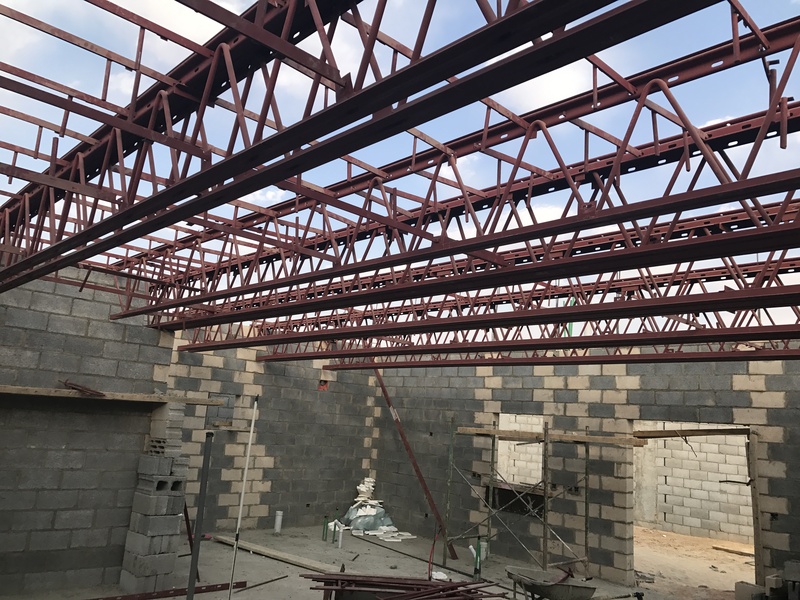 The open space that the steel trusses provide is used for mechanical, electrical and plumbing lines. The hanging metal channel is used to affix the drywall. 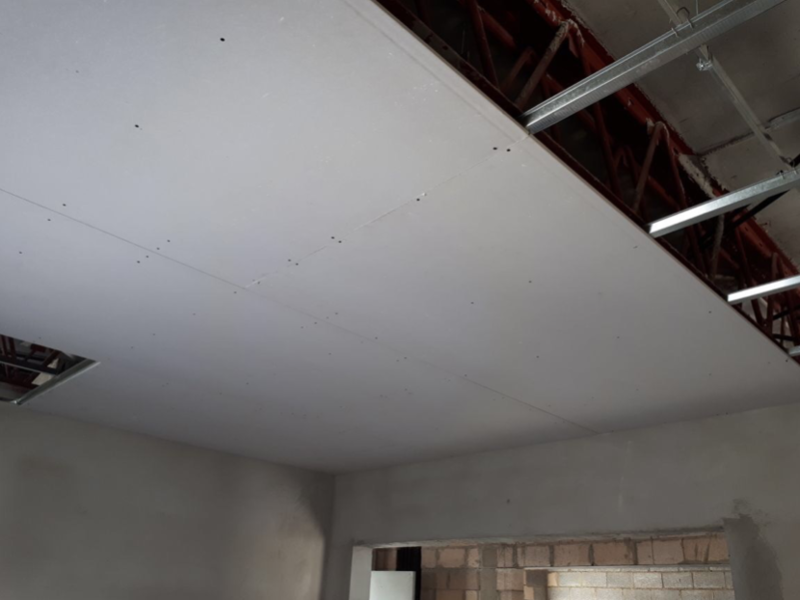 As an extra benefit, the space also allows adequate room for any type of recessed lighting installation and the flexibility of locating it practically anywhere in the ceiling. 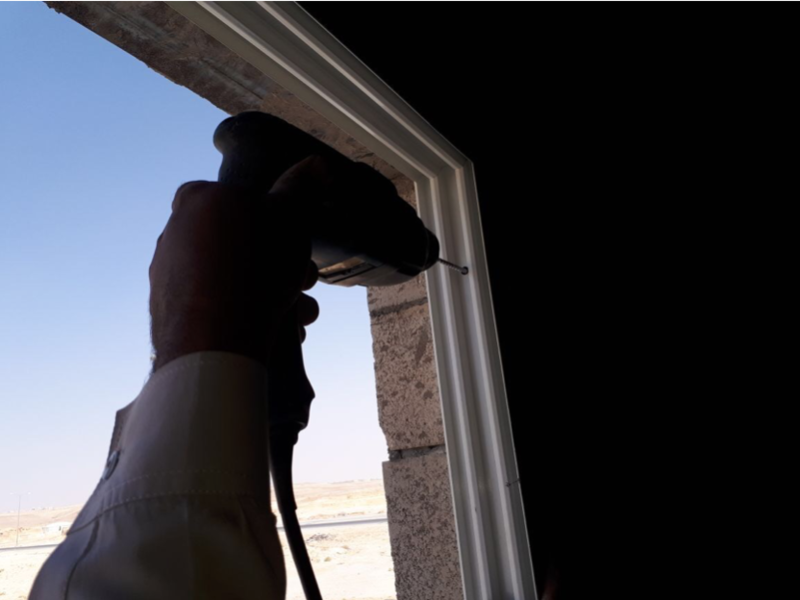 Windows and doors are installed by drilling into the solid grouted jamb block and using masonry screws as shown below. 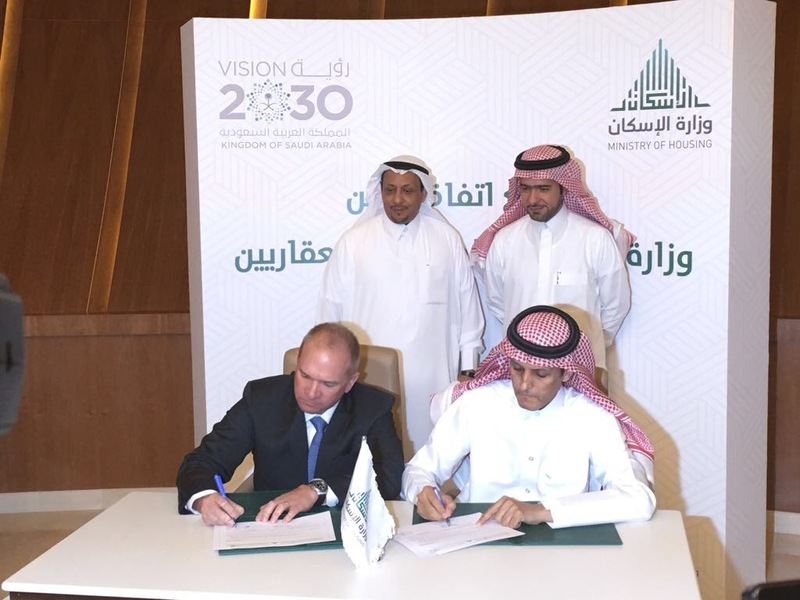 Distinguished members of the Kingdom of Saudi Arabia’s Ministry of Housing and Al Tahaluf’s CEO, Robert Hofmann sign a partnership agreement for Al Tahaluf to build 2340 townhouses and single-family villas near the airport. 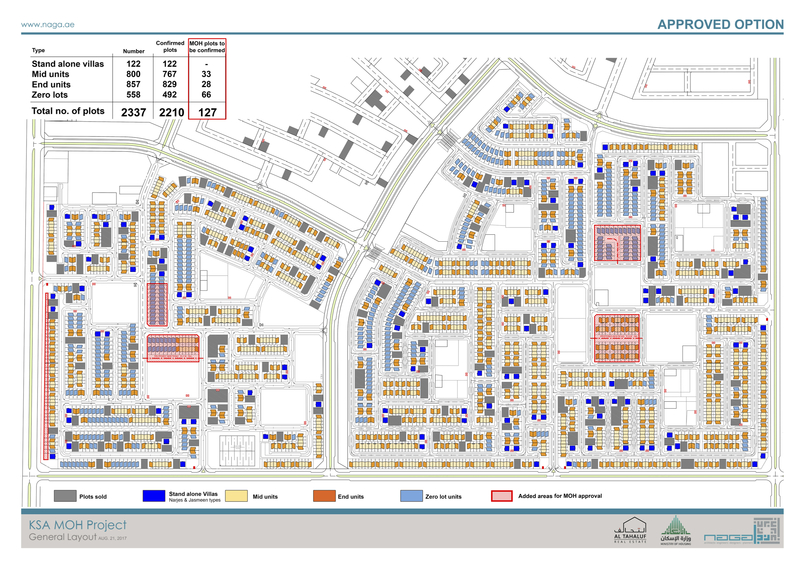 Please see the proposed site plan below. 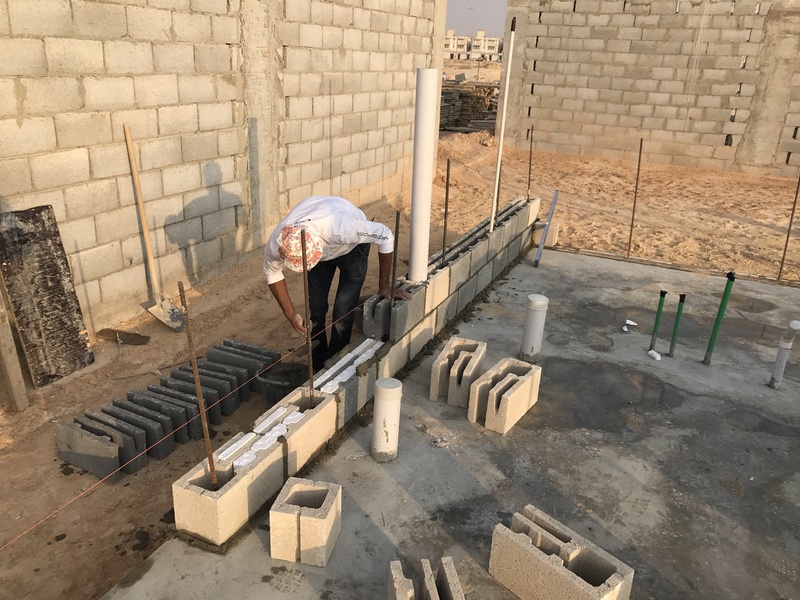 To view specific photos of how PLUMBING embeds are installed into Omni Block buildings click on the highlighted link. 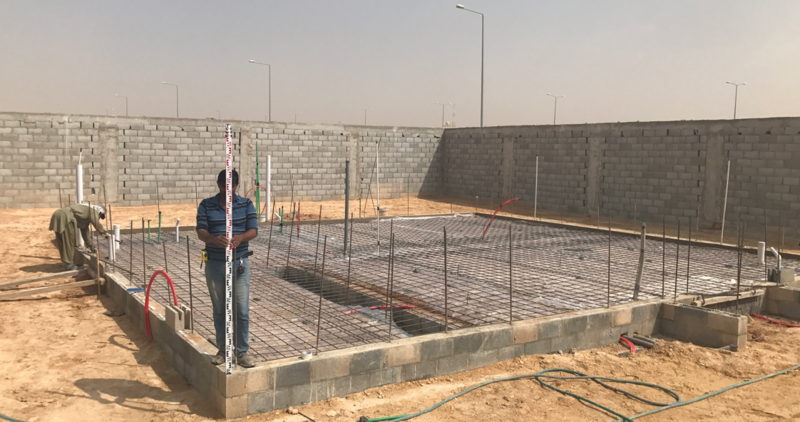 To view specific photos of how ELECTRICAL embeds are installed into Omni Block buildings click on the highlighted link. 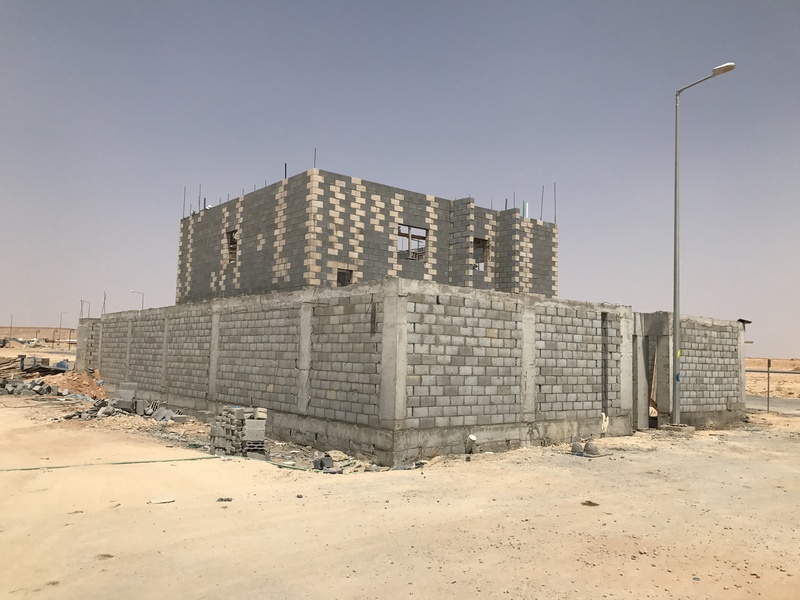 To view other Riyadh projects currently UNDER CONSTRUCTION in the same neighborhood as the villa click on the link.